Puddle jumping at the beach with his friend Merlin: about as close to pure joy as it gets. 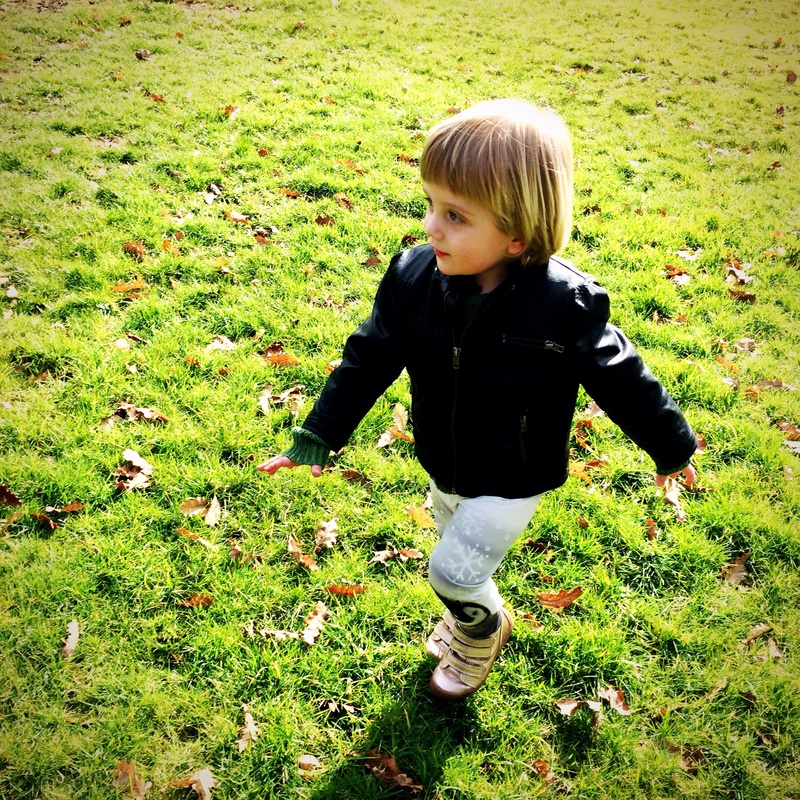 Linking up with Jodi at Practising Simplicity for The 52 Project. 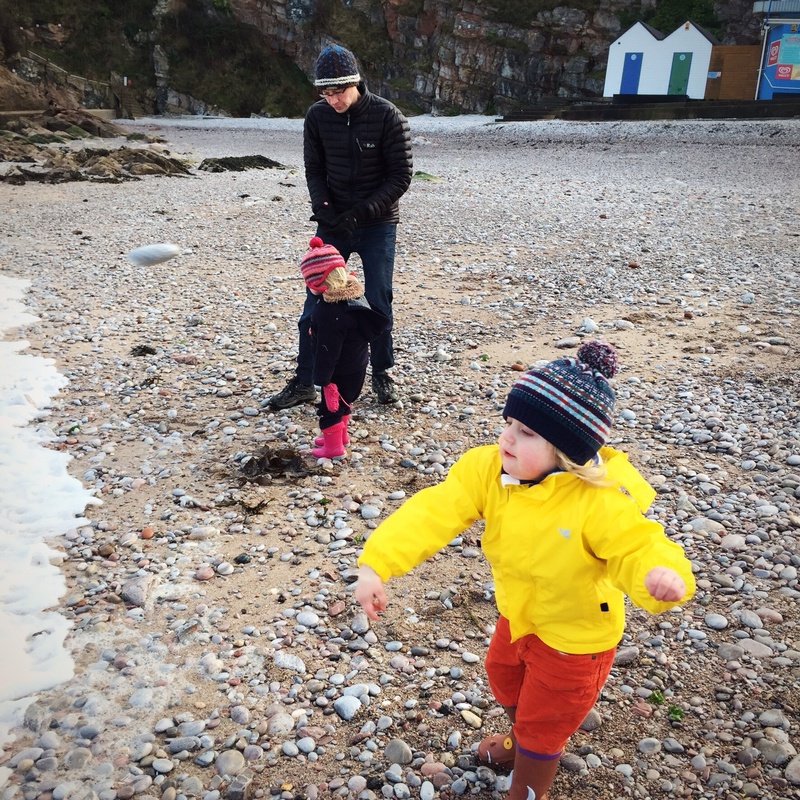 This entry was posted in Sophie is parenting, Sophie is photographing, Sophie loves Devon, Uncategorized and tagged beach, Childhood, dog, jumping, puddles, summer on July 3, 2016 by sophieblovett. 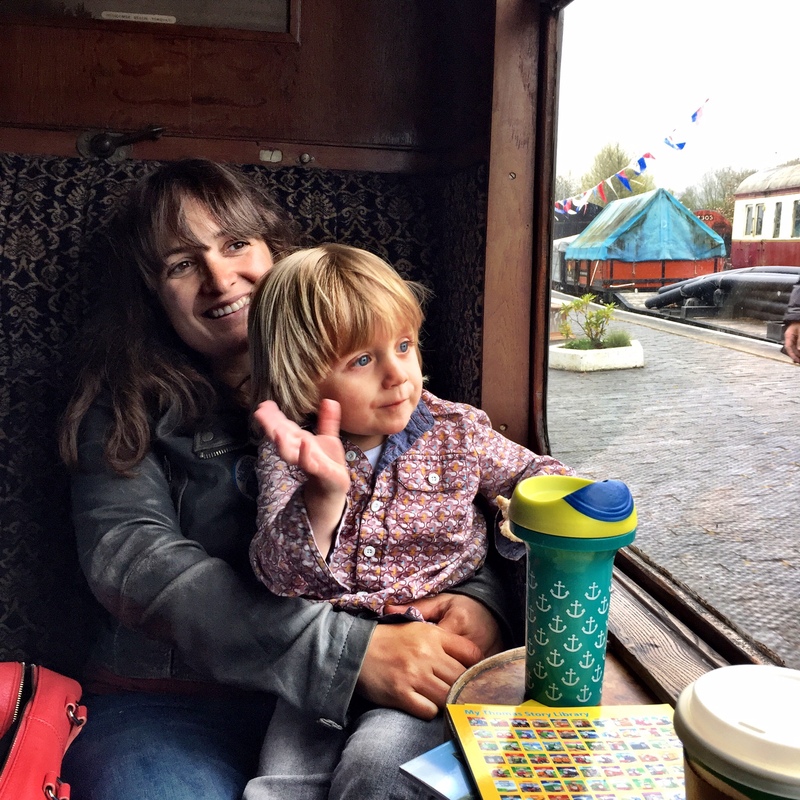 It was Leigh’s birthday over the bank holiday weekend, and in true super-Dad style he declared that there was nothing he would rather do than go to the Day Out with Thomas at the South Devon Railway. 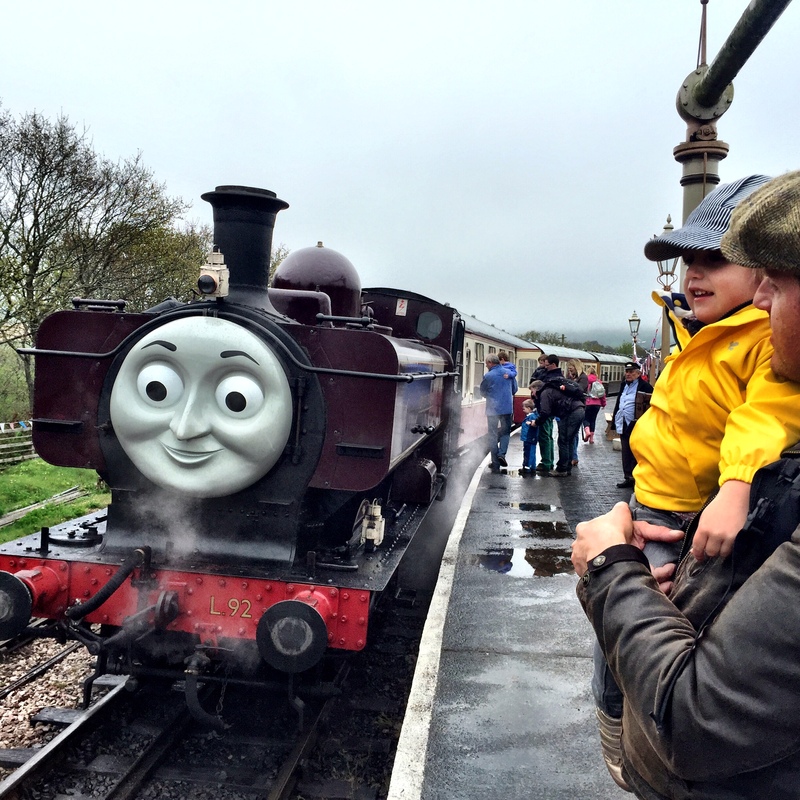 Not only would this involve some serious steam train action, but all the trains were promised to be dressed up as characters from Arthur’s favourite books. 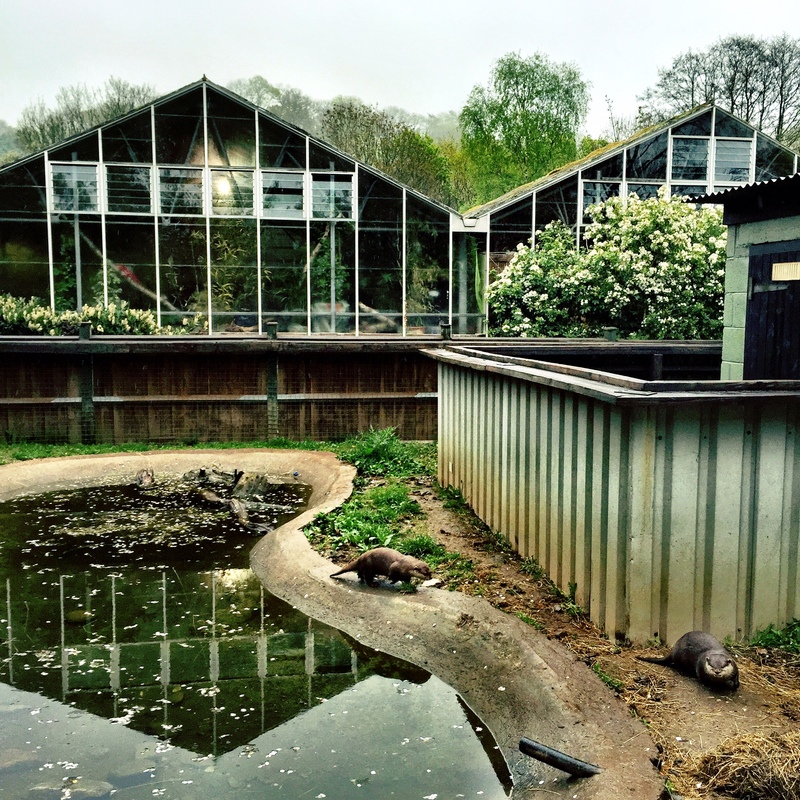 And the ticket would give us access to the Totnes Rare Breeds Farm (which we’d visited before and loved) and the Butterfly Farm and Otter Sanctuary in Buckfastleigh (which I’ve wanted to explore for years). 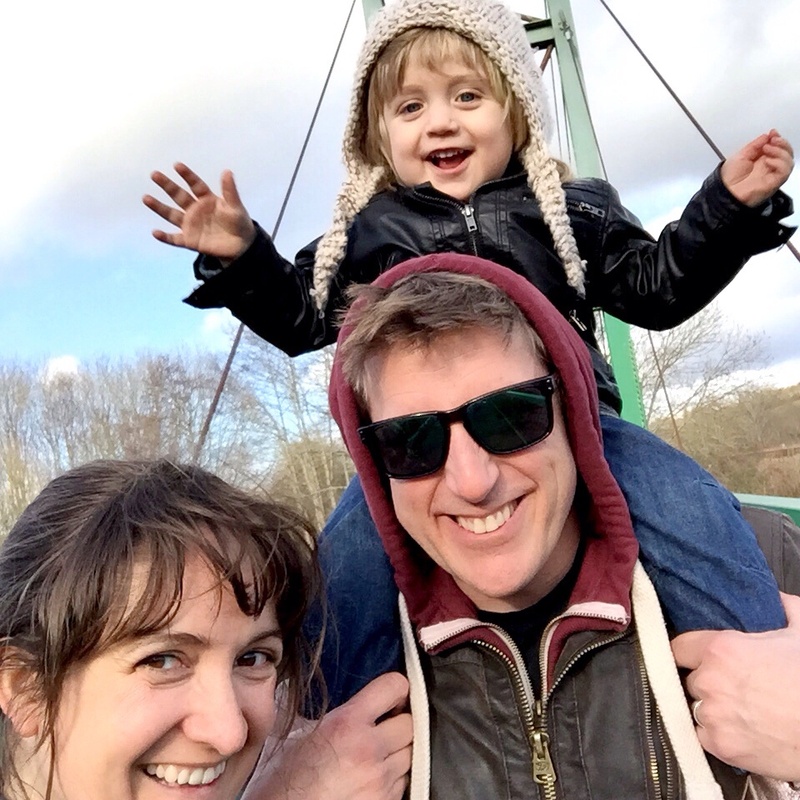 We were all really excited about it, and looking forward to spending some quality time together as a family in the midst of Finals revision and election campaigning. 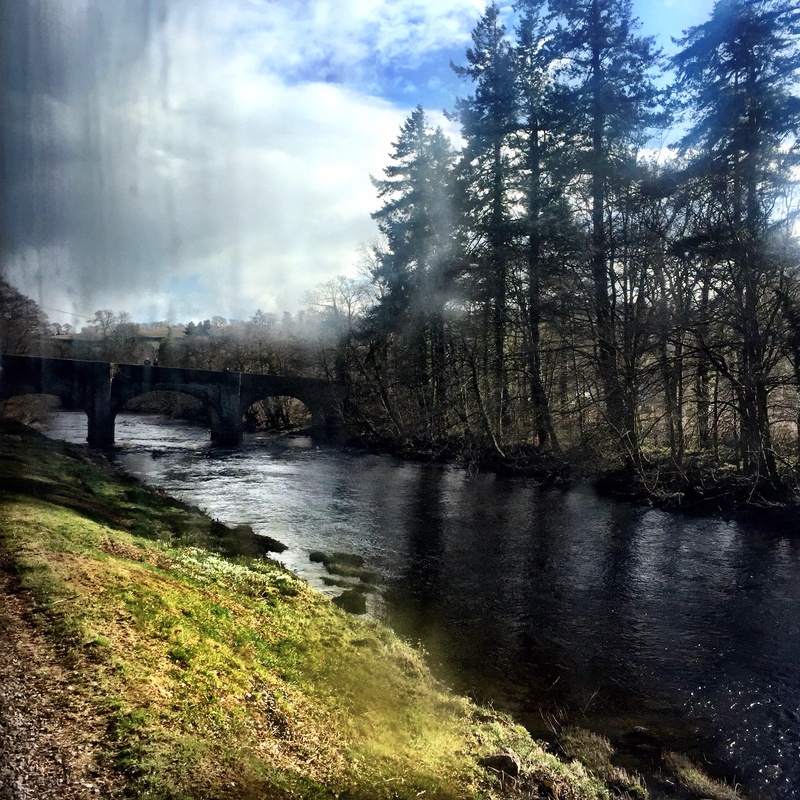 Our day was very nearly scuppered when we had a massive leak after our morning shower (all sorted now, I won’t go into it…) but fortunately we decided to power through and make the most of the adventures that lay ahead. 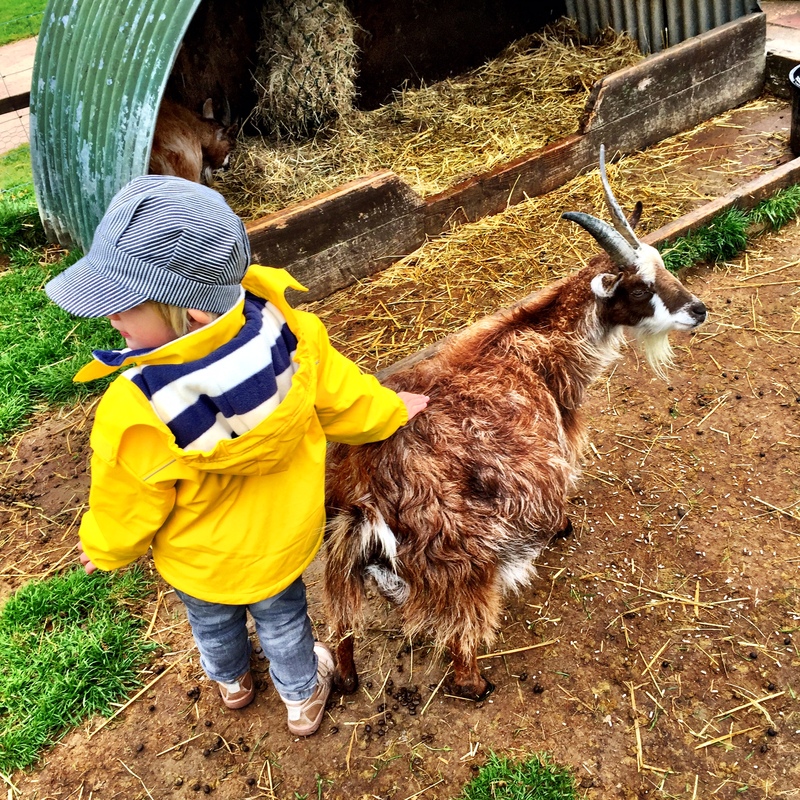 The Arthur train was getting ready to leave, but as we’d just arrived we decided we’d pop over to the Rare Breeds Farm first to say hello to the animals. 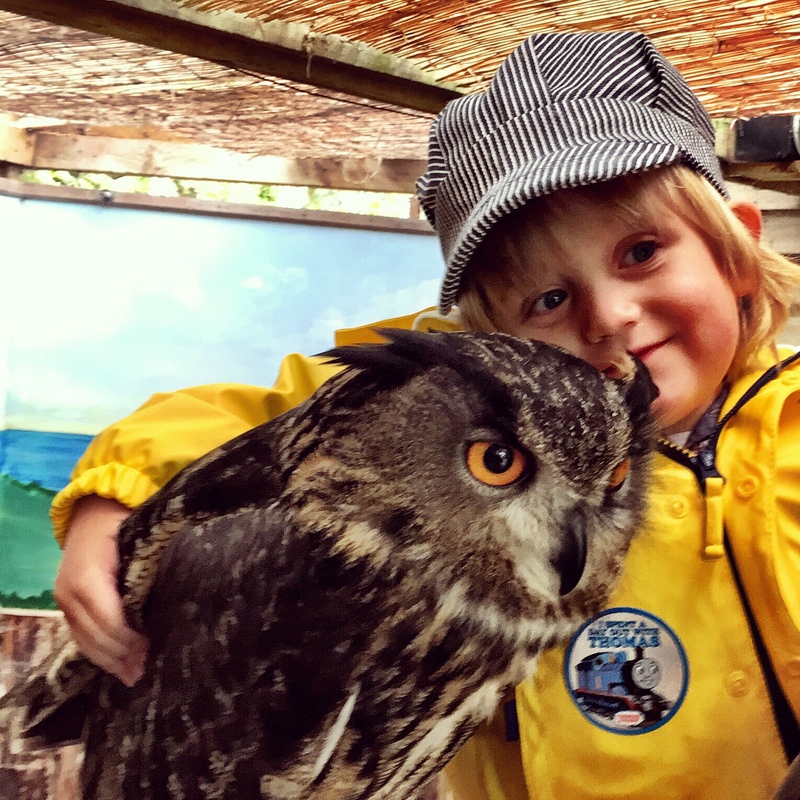 Arthur recognised the owl he’d met on the train platform before the season had properly started, and with his keeper’s encouragement went in for a very cute cuddle. 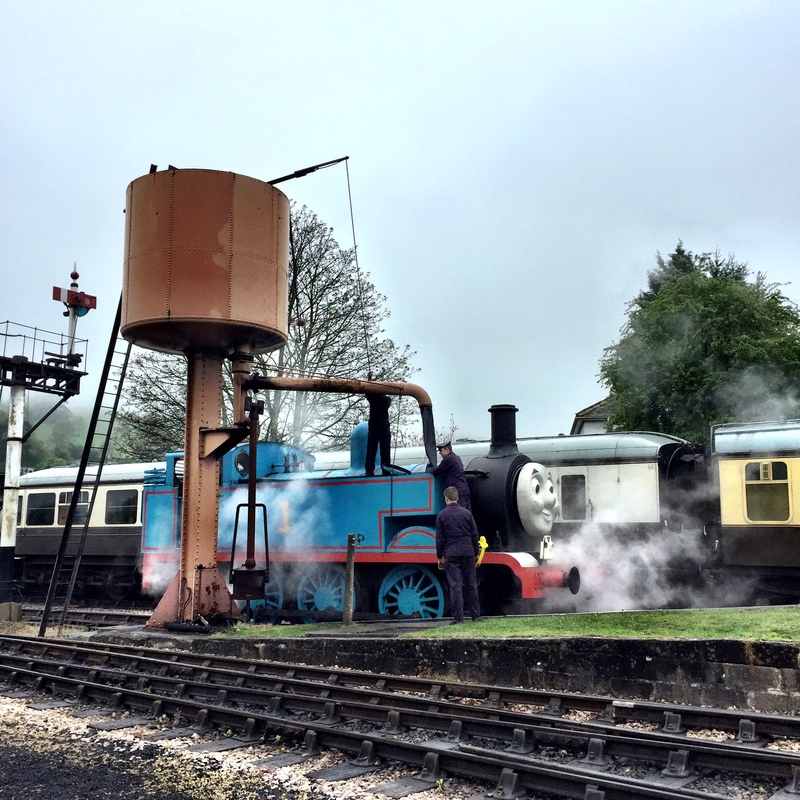 After that there were goats to be stroked, a tractor to be driven and a cow to be milked – though it wasn’t long before Arthur’s attention wandered back to the trains. 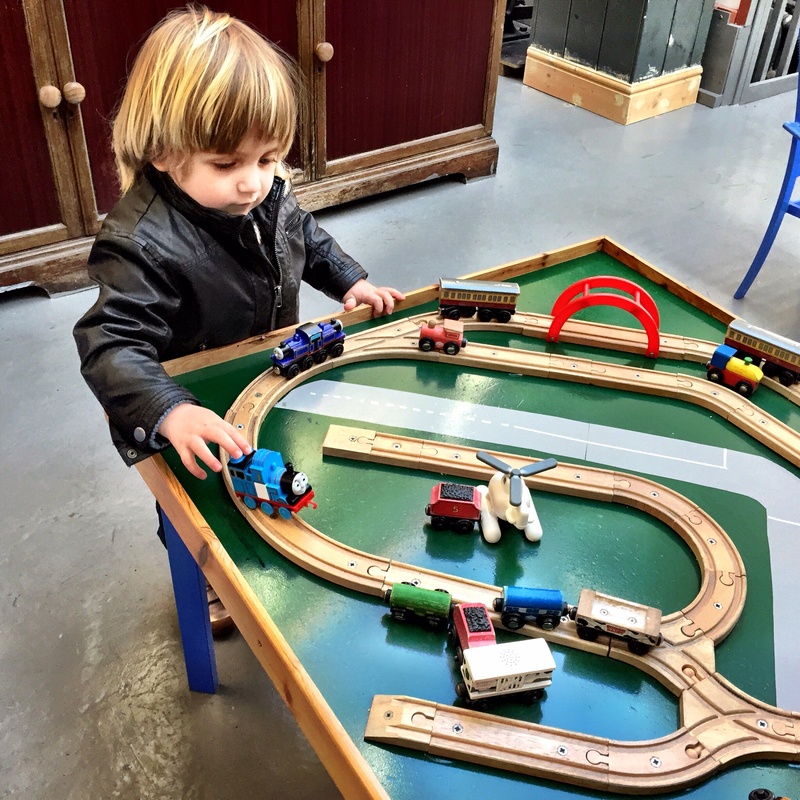 There was still a bit of time until the next train was due, so we took a look at the model railway. 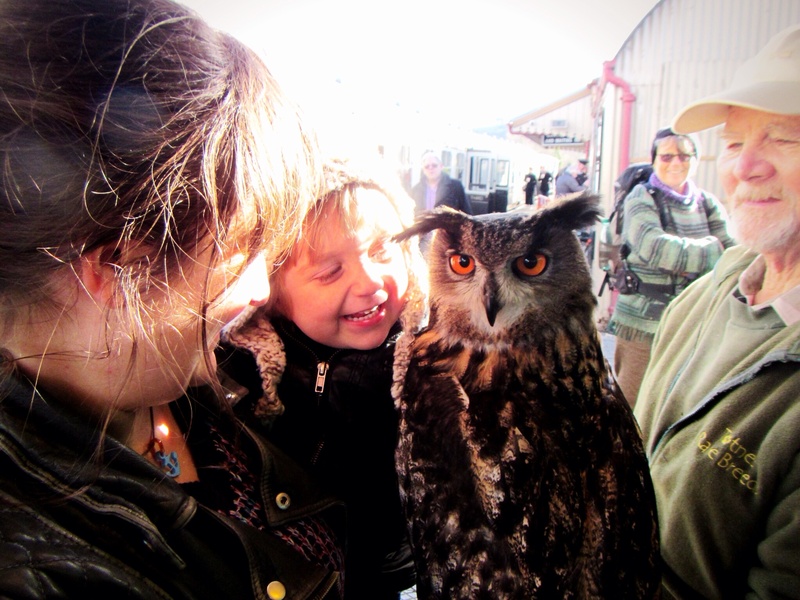 Arthur was fascinated by it, though it was all we could do to stop him from clambering up for a closer look! 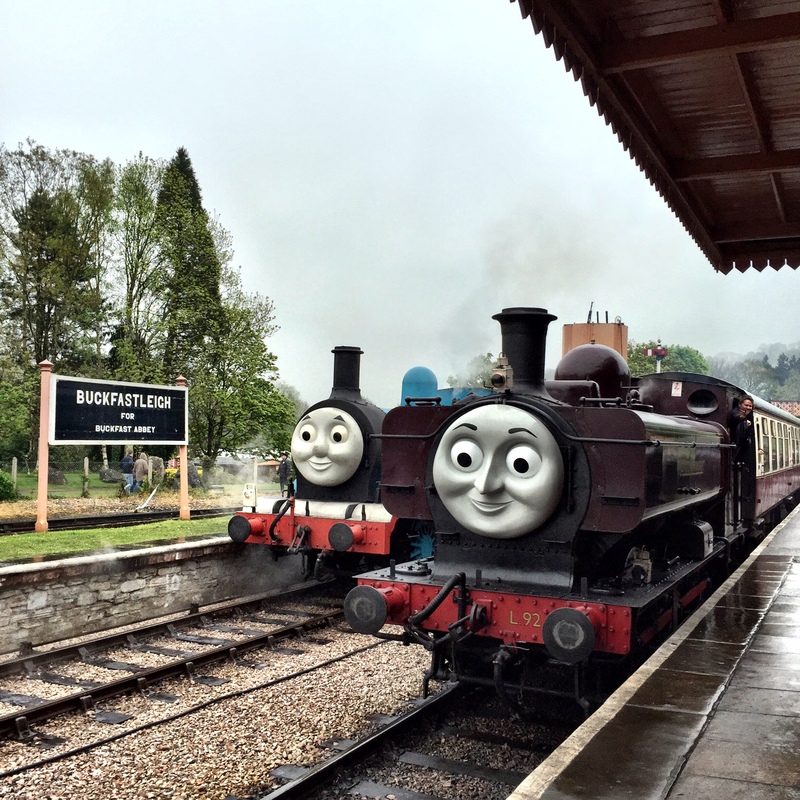 Then finally it was time to board a train and head for Buckfastleigh. 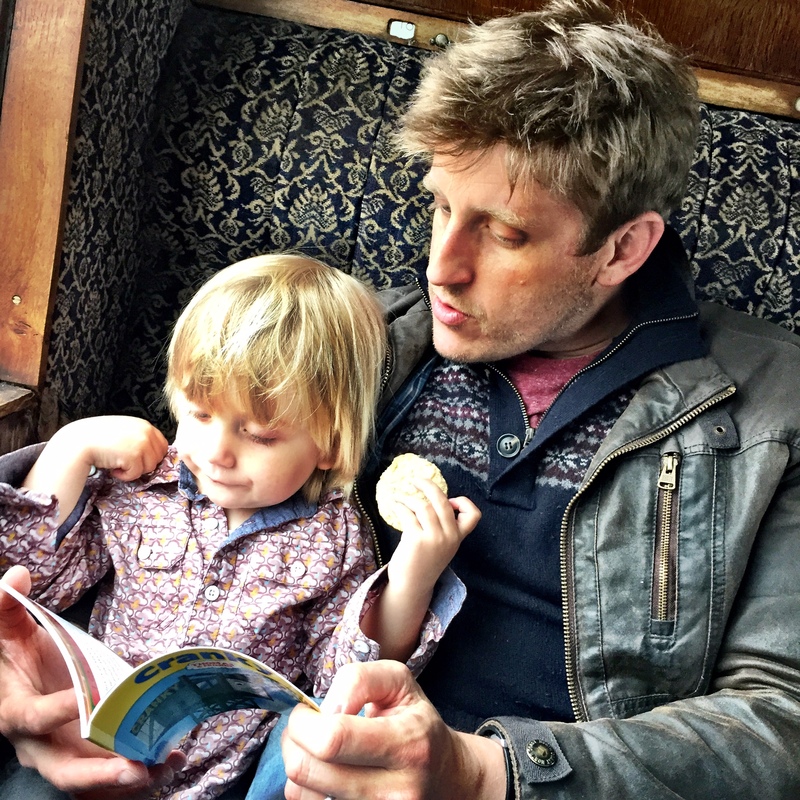 We picked up a couple of books to add to Arthur’s Thomas collection at the stall on the platform, and he spent the journey reading those and waving at people out of the window. 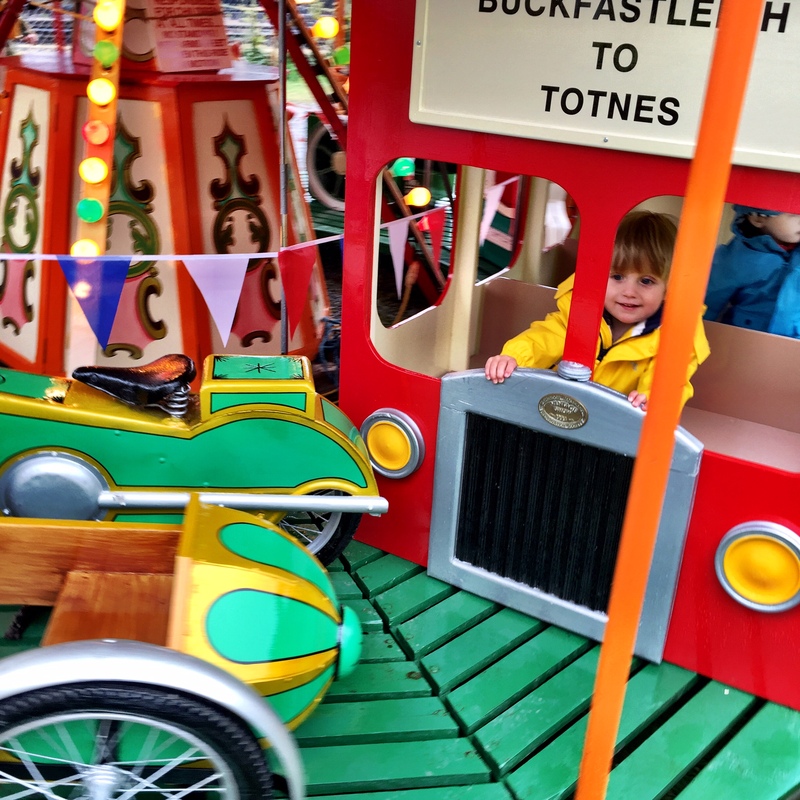 There was lots going on at Buckfastleigh: several more engines to admire, including Thomas himself, train tracks to play with and even a fairground ride! 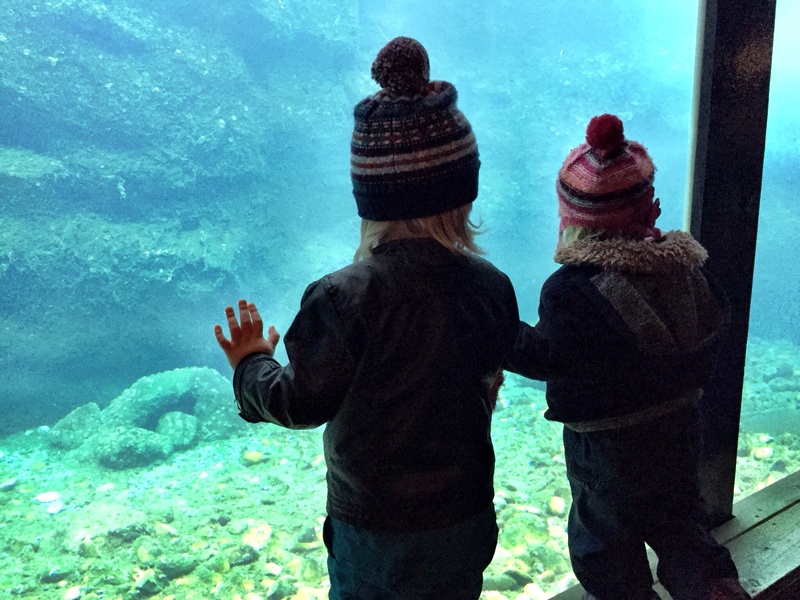 There were the otters and butterflies too, and they were amazing! 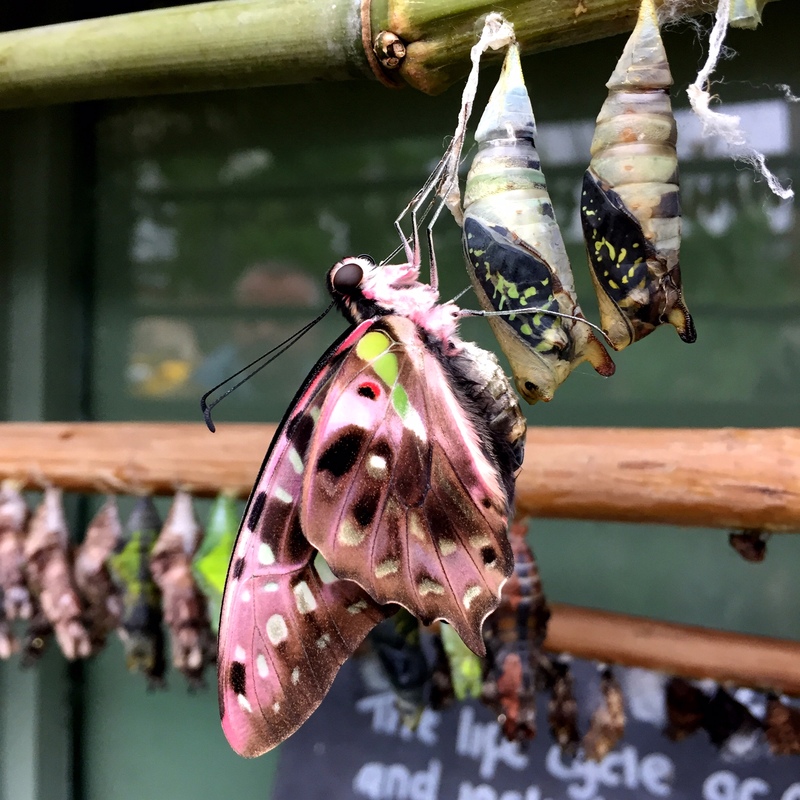 The butterflies flying around the hothouse were pretty magical, but it was the cocoons that really stood out for me. 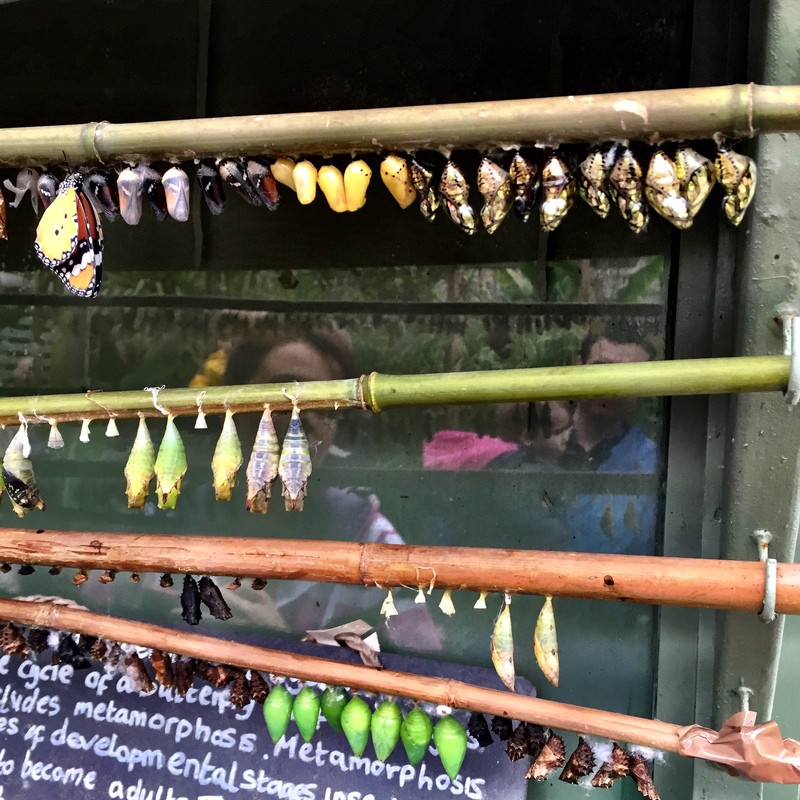 I’ve never seen anything quite like it – from a distance the racks they were on looked like they were exhibiting an exotic range of jewellery, but as you got closer their real purpose became clear. Arthur didn’t quite understand what he was seeing. 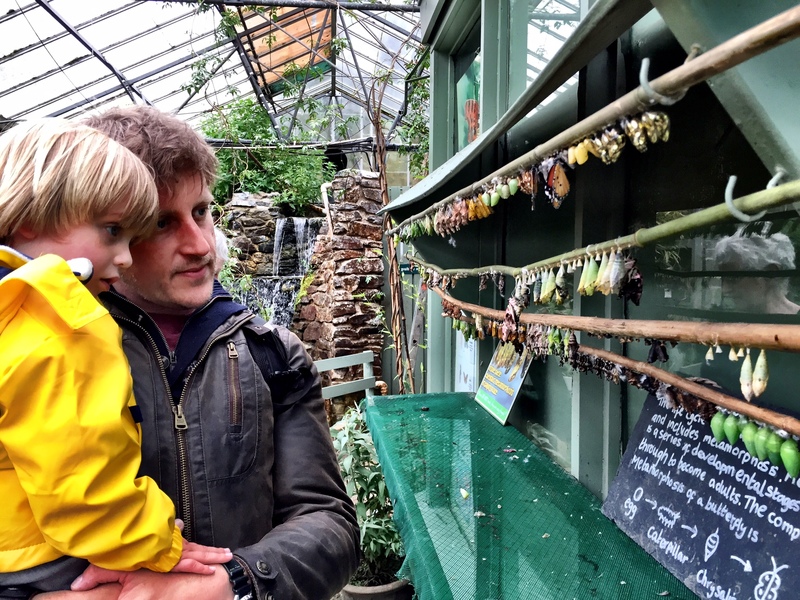 There was one slightly hairy moment when he reached out to touch and almost dislodged a whole row of chrysalises, but fortunately we got to him just in time! 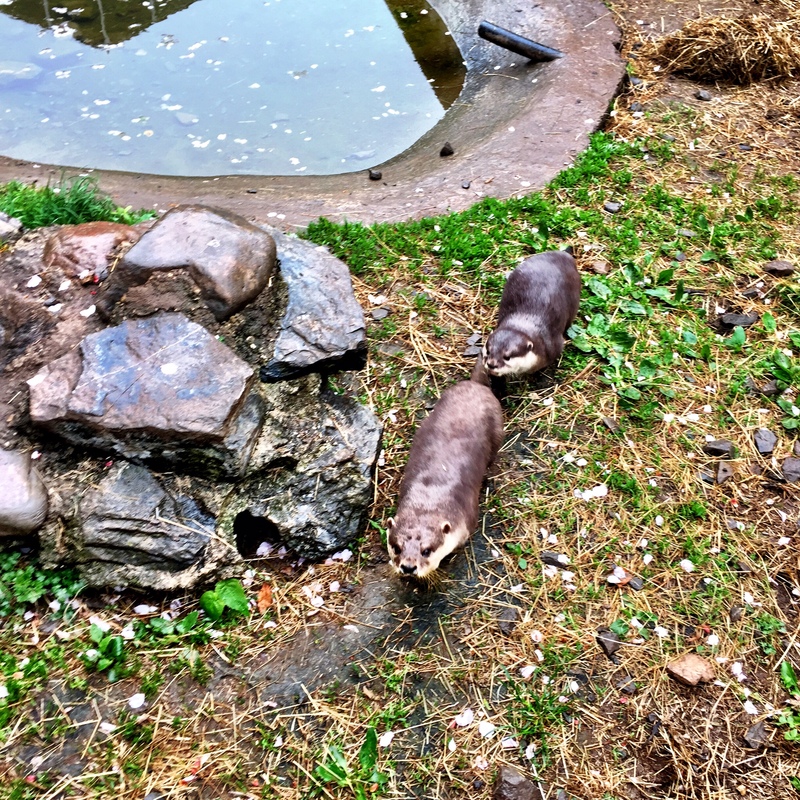 The otters were super cute, and looked like they were having lots of fun, which is always nice to see. That was enough to finish Arthur off. He was asleep before the end of our ten minute round trip, and stayed fast asleep until we were on the train back to Totnes. We said goodbye to Thomas for him though, and I have no doubt his dreams were full of wonderful things. 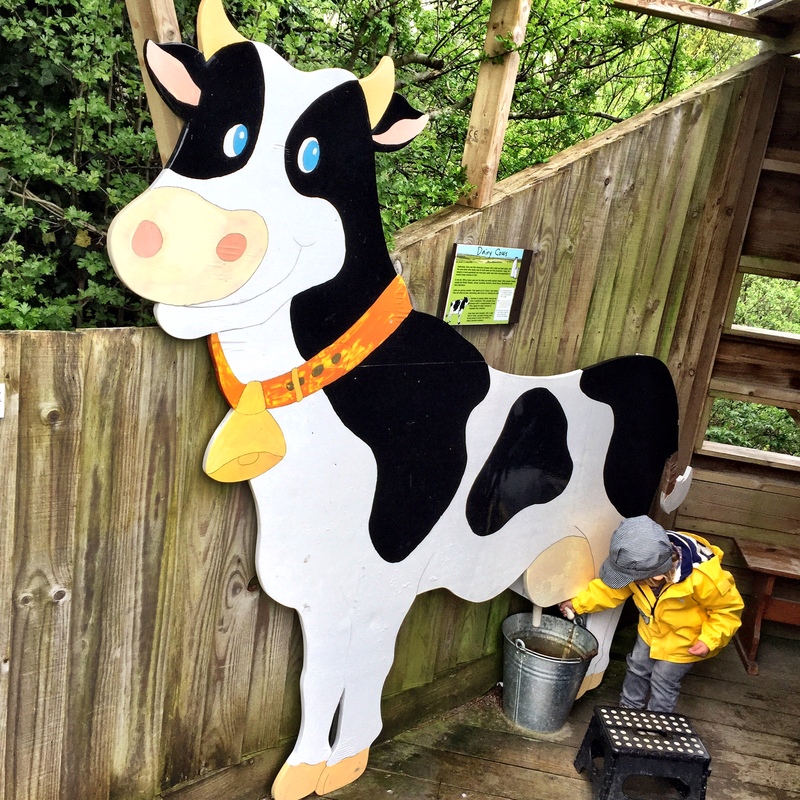 There was certainly enough from our day out to keep him going for weeks! 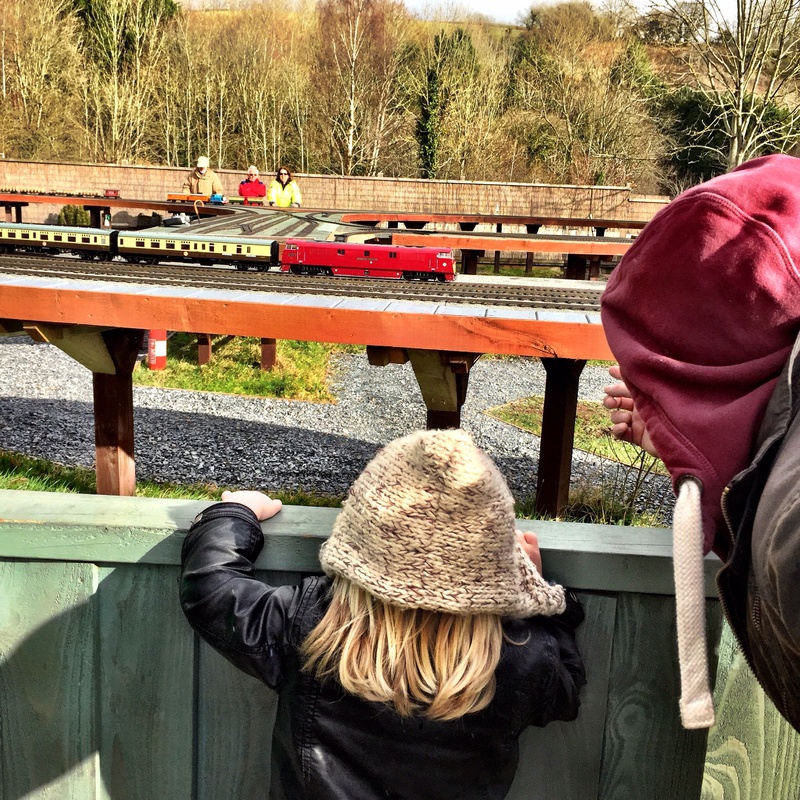 This entry was posted in Sophie is parenting, Sophie is travelling, Sophie loves Devon, Uncategorized and tagged Buckfastleigh, otters and butterflies, Rare Breeds Farm, South Devon Railway, steam trains, thomas and friends, thomas the tank engine, trains on May 12, 2015 by sophieblovett. 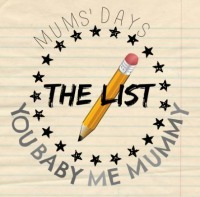 Alongside everything I have been doing this week – creeping ever closer to a completed third draft of my novel, keeping up with Arthur’s ever-expanding social calendar, and supporting Leigh through another wave of deadlines – there has been the faint bubble of anticipation. The sense that, after weeks and months of the dark and the cold of winter, spring might finally, actually, be just around the corner. Arthur and I were at my parents’ place last weekend. Although they’re less than an hour away, and still on the sea (well, the estuary anyway), the environment there feels very different. They are surrounded by countryside, and there is no escaping the shifting seasons. So it was there I noticed spring first. It took me almost by surprise, but it has not disappeared since we returned to Brixham. 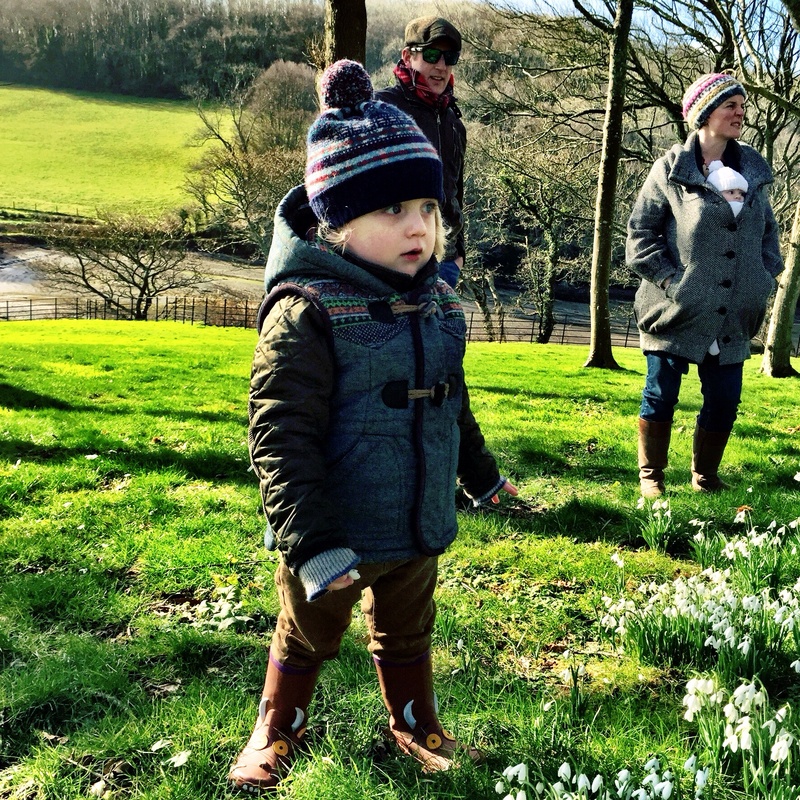 Arthur has learnt the words for primrose, snowdrop and daffodil this week. He sought out the little patches of colour as we traversed the woodland, and I couldn’t help but notice the shoots beginning to seep from winter branches. 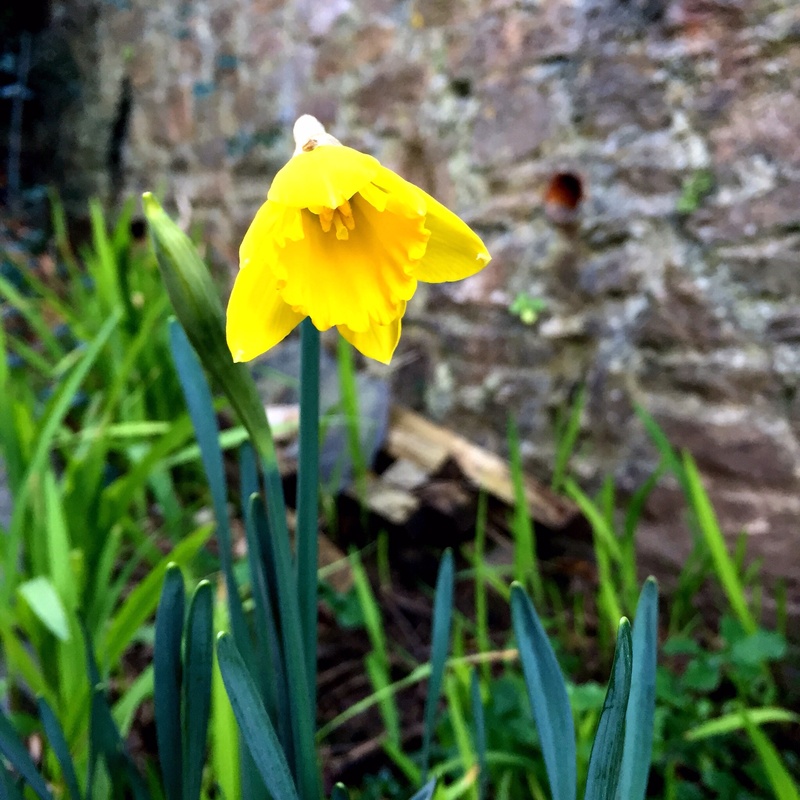 Back home we saw that our own daffodils had finally burst out from their buds, trumpeting the promise of warmer, lighter days to anyone who cared to listen. For the past few months my parents’ chickens have refused to lay. The flock was expanded at the end of last year, and ever since their nest has remained empty. In the past few weeks they have seemed to call an end to their strike. 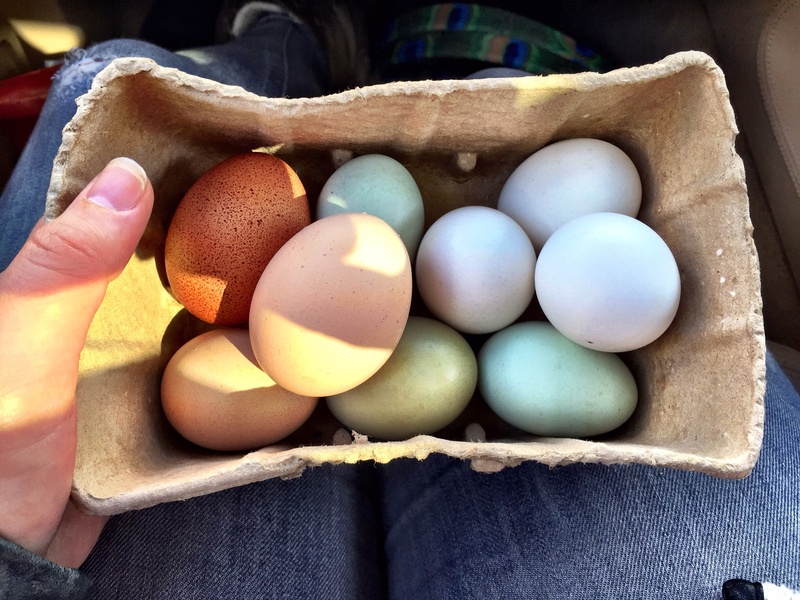 Looking at the beautiful eggs they are now producing in abundance it seemed way too coincidental to have nothing to do with the coming of spring: and on doing a little research I discovered that sure enough, the longer days have much to do with the chickens’ willingness to release their eggs into the world. We travelled home on Monday with a collection of them, almost too lovely to eat. I am pleased to report that they were delicious. One thing that spring can be guaranteed to bring is crazy weather, and this week has most definitely not disappointed on that front. 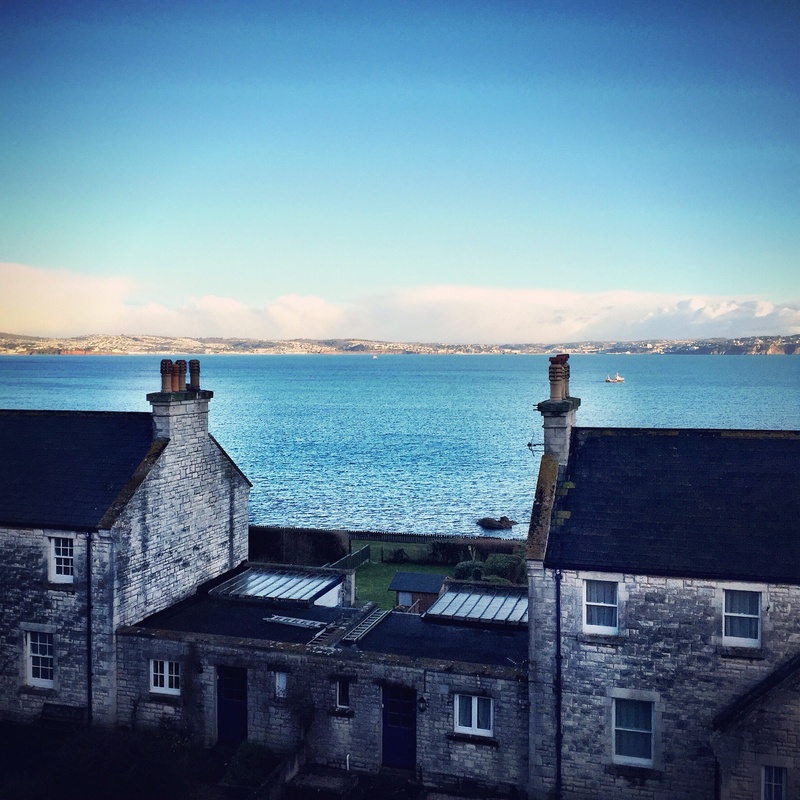 On Tuesday, we were woken up by a hailstorm at three am – it was so insanely loud I thought for a while it might dislodge the slate on the roof. A few hours later, we woke again to pink skies reflecting off the sheen of an almost perfectly still bay, the only sound being the squark of seagulls and the distant drone of fishing boats heading out to sea. A text came through from a friend as I was getting Arthur organised to head out to his drama class, saying that we should make the most of the glorious day. Just as I was sending my agreement, the rain rolled in. Yet by the time we were ready to leave it was beautiful once again. Dark clouds gathered before the day was done. 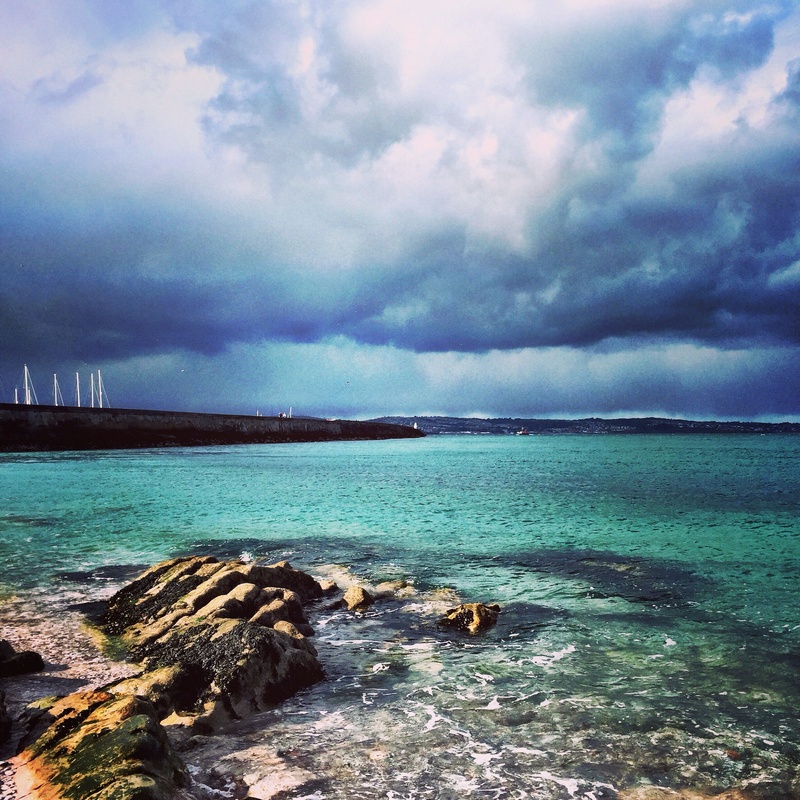 The weather this week has most definitely been unpredictable, but not entirely unpleasant. We had music today at Lupton House, followed by the precious coffee and catch-up I’ve come to so look forward to. Afterwards us mums stood and chatted as the children played, tentatively exclaiming our delight at the warmth which filled the air. This is perhaps the least tangible of the signs that spring is on its way, but it’s no less important for that. 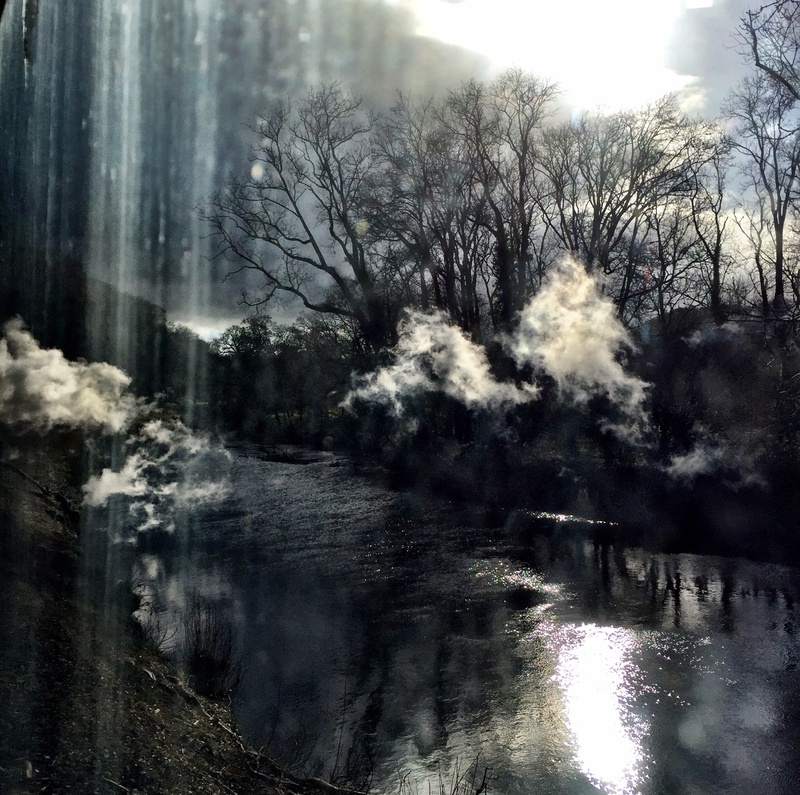 I cope with winter better than I used to, but still during the past few weeks I’ve felt a little like I’ve been wading through treacle just to manage the tasks which make up the day to day. But this week that sense of drudgery has been replaced with hope, with the anticipation of spring rolling into summer, of leaving the house without a coat and returning in the evening whilst it is still light. I suppose deep down I love the seasons, all of them, for the contrasts they bring. But I cannot deny that I have my favourites, and spring is most certainly one of them. My word of the week this week is spring. 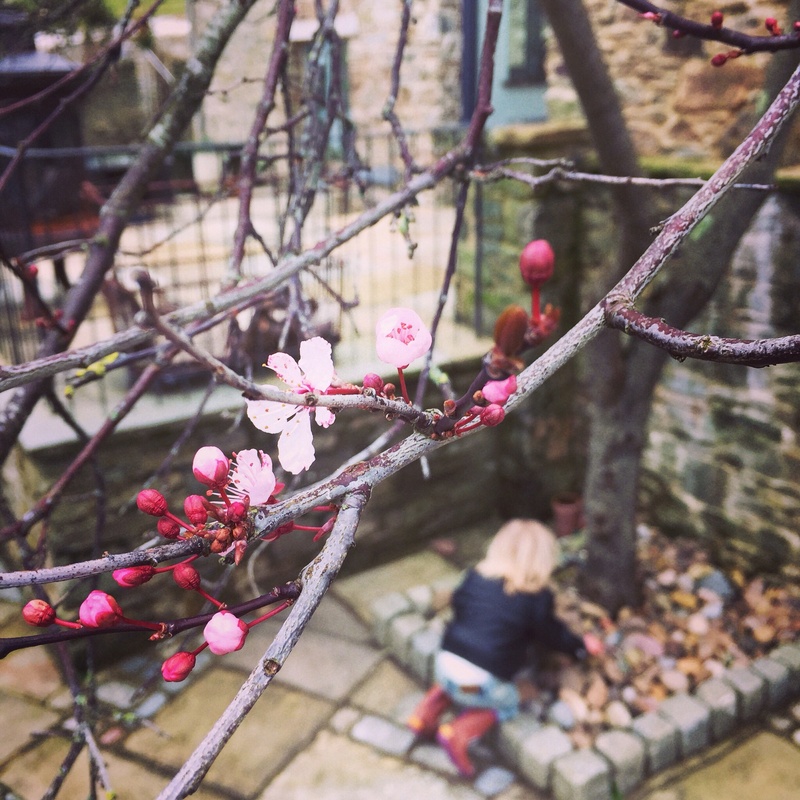 This entry was posted in Sophie is, Sophie is parenting, Sophie is photographing, Sophie loves Brixham, Sophie loves Devon and tagged chickens, countryside, Devon, flowers, seasons, spring, weather on March 6, 2015 by sophieblovett. 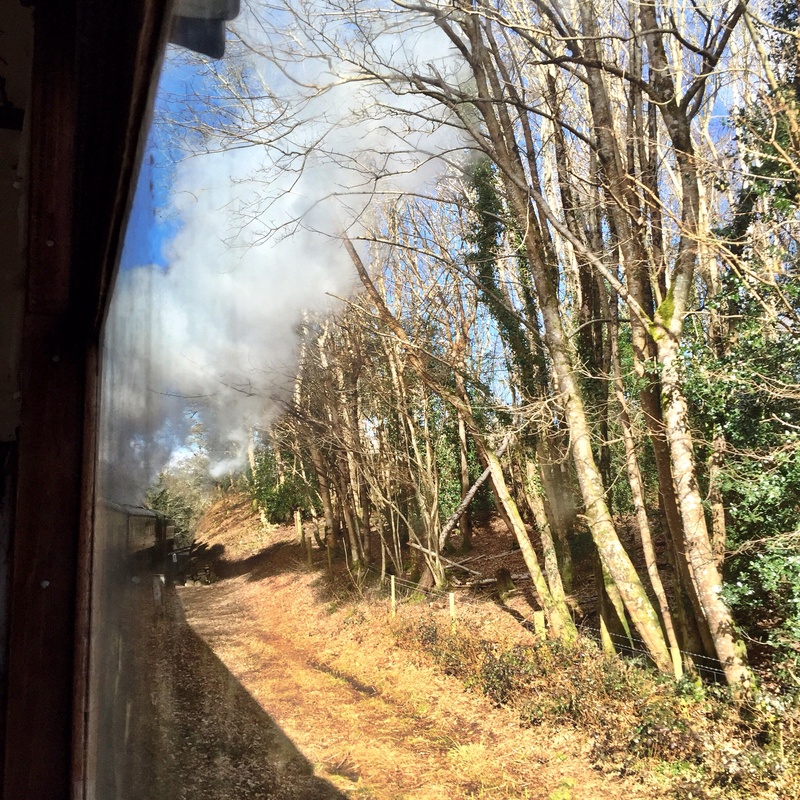 Last weekend we finally took a trip on the South Devon Railway. 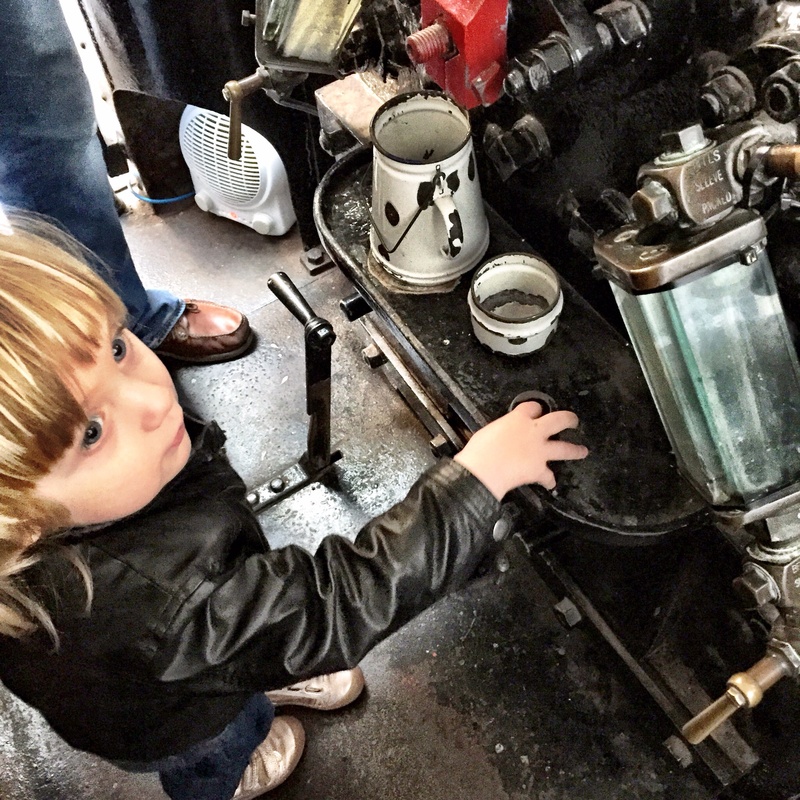 I’m not sure why we haven’t done it before actually, what with Arthur’s general train obsession, but we’re a bit spoilt for choice down here when it comes to steam trains. 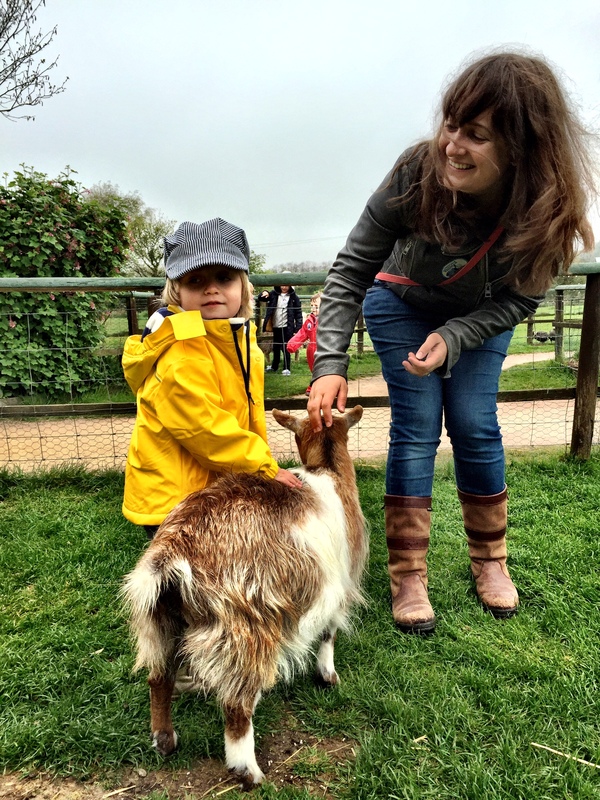 We’ve been on the Kingswear-Paignton line lots, but having had a peek at the goings on at Totnes station when we visited the Rare Breeds Farm we were definitely keen to come back for a proper visit. 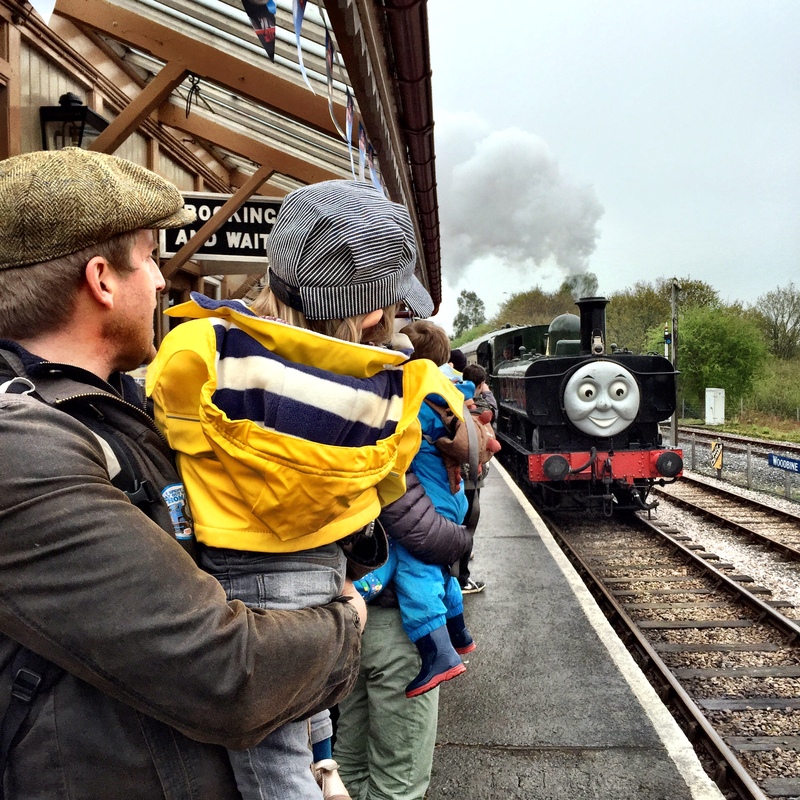 The excitement started building even before we got to the station – Arthur heard a train whistle in the background and suddenly realised where we were going. 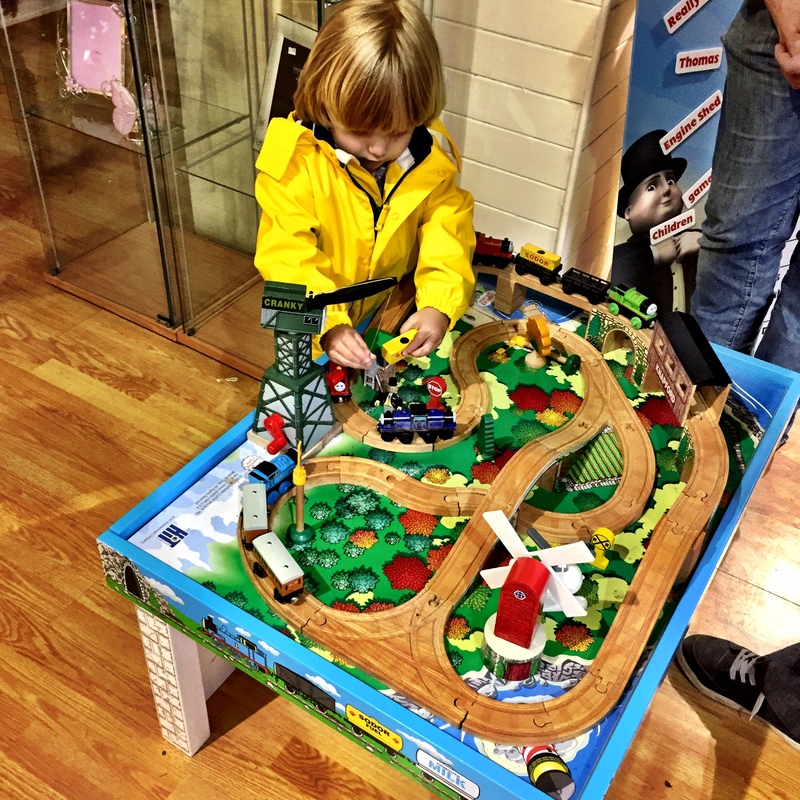 Once he saw the train tracks he really couldn’t contain himself, bouncing up and down in the sling as the train came in. 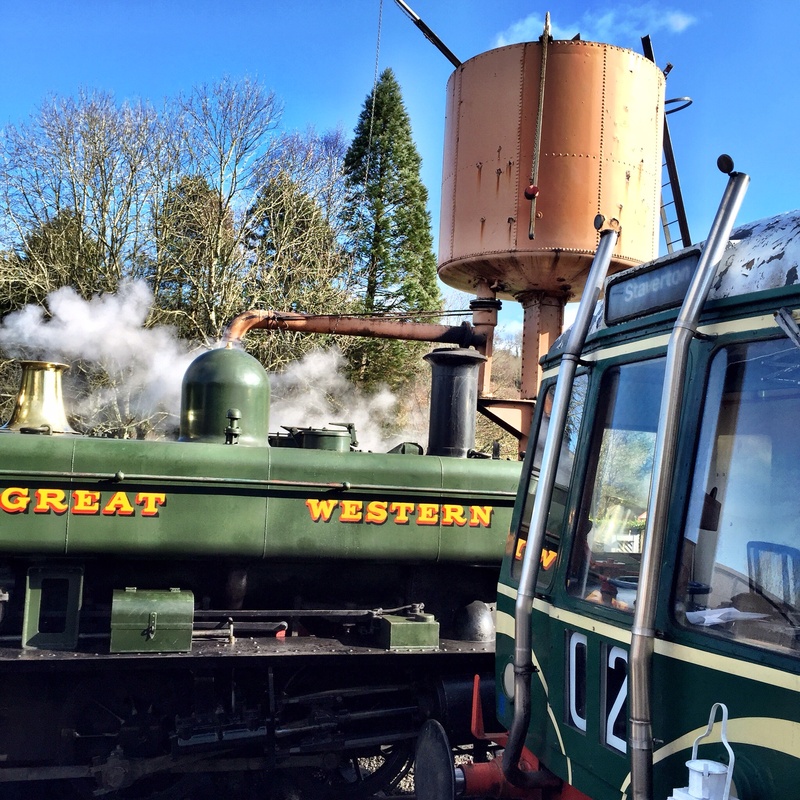 We found ourselves a compartment – naturally gloriously vintage – and settled down for the journey to Buckfastleigh. 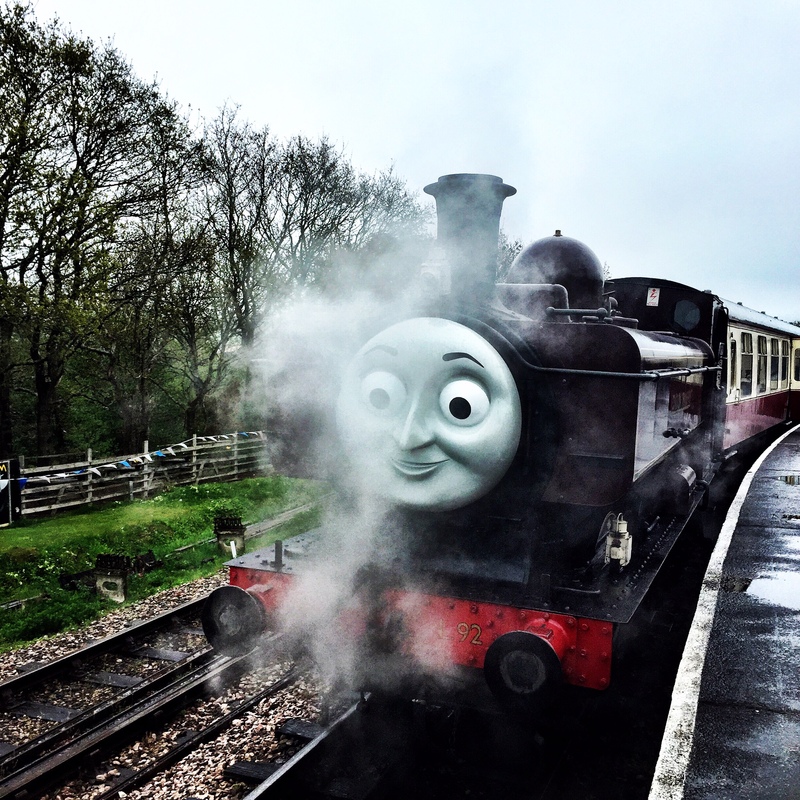 It wasn’t only Arthur who was excited – there’s something so magical about being transported by steam, and the beautiful countryside views just added to that. 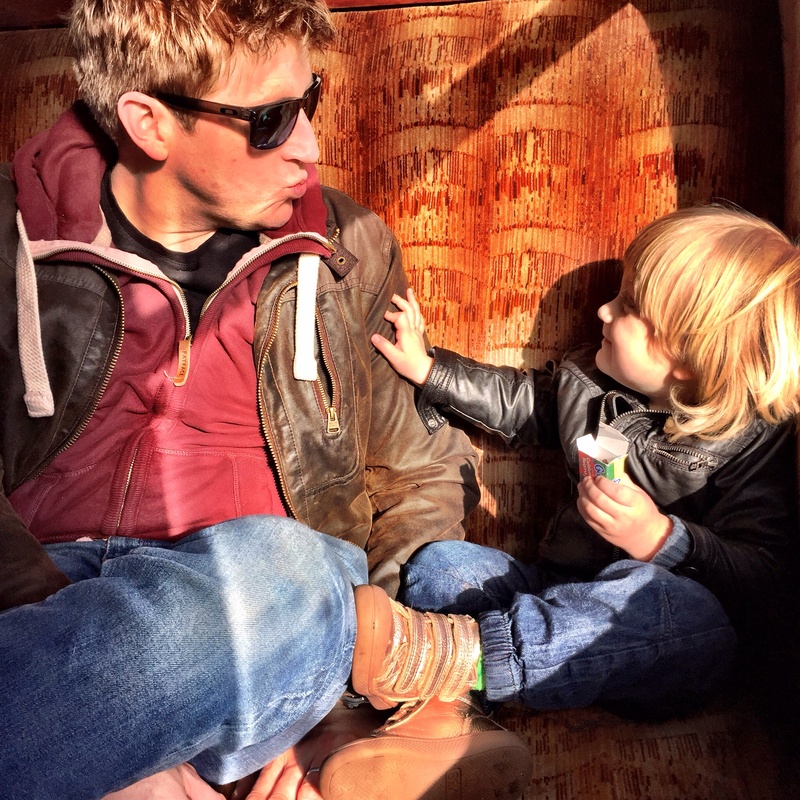 It was brilliant to spend some quality time as a family. 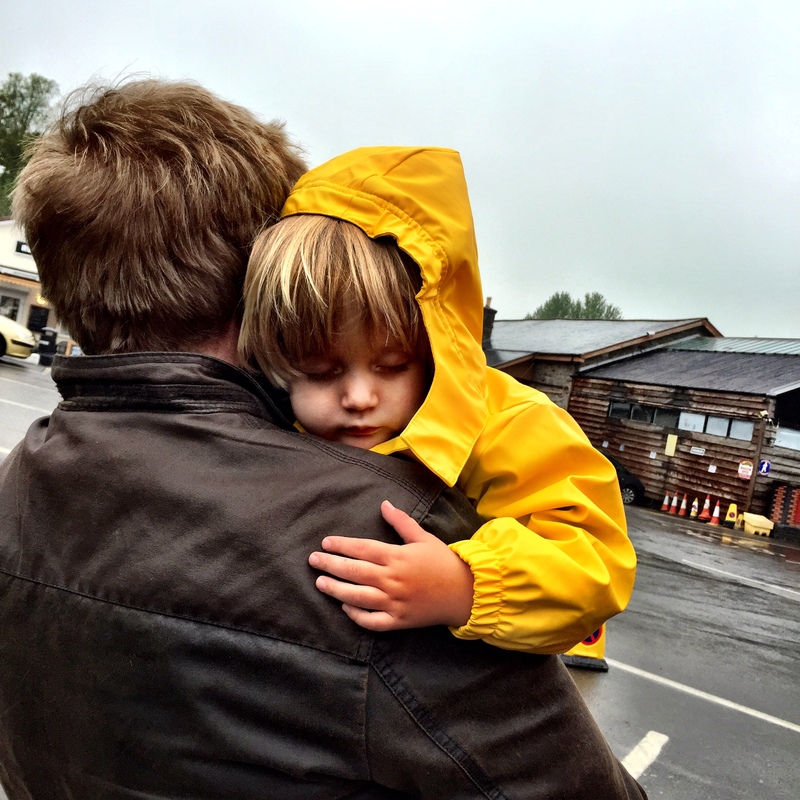 Leigh’s been working super hard recently, and Arthur really misses his Daddy when he’s not around. I do, too. 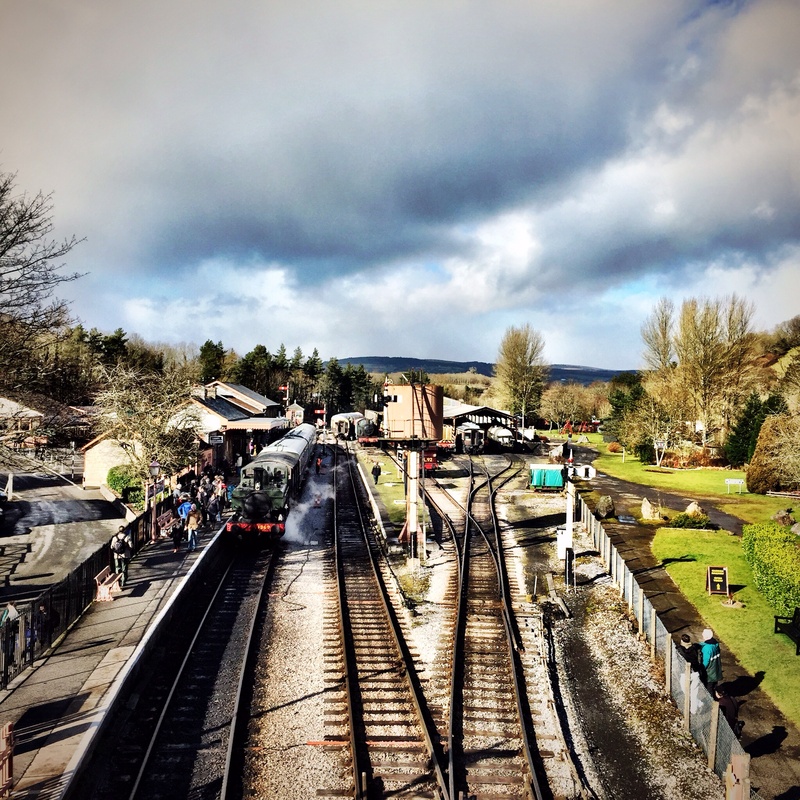 As we pulled into Buckfastleigh station, it was clear there was going to be lots to explore there. 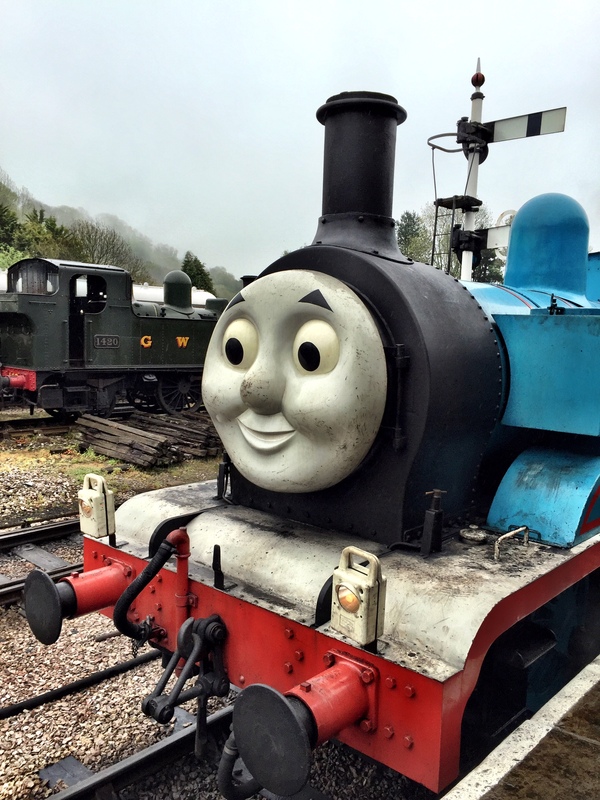 There were so many different types of trains – Arthur was in his element trying to match them all up with his favourites from Thomas the Tank Engine. 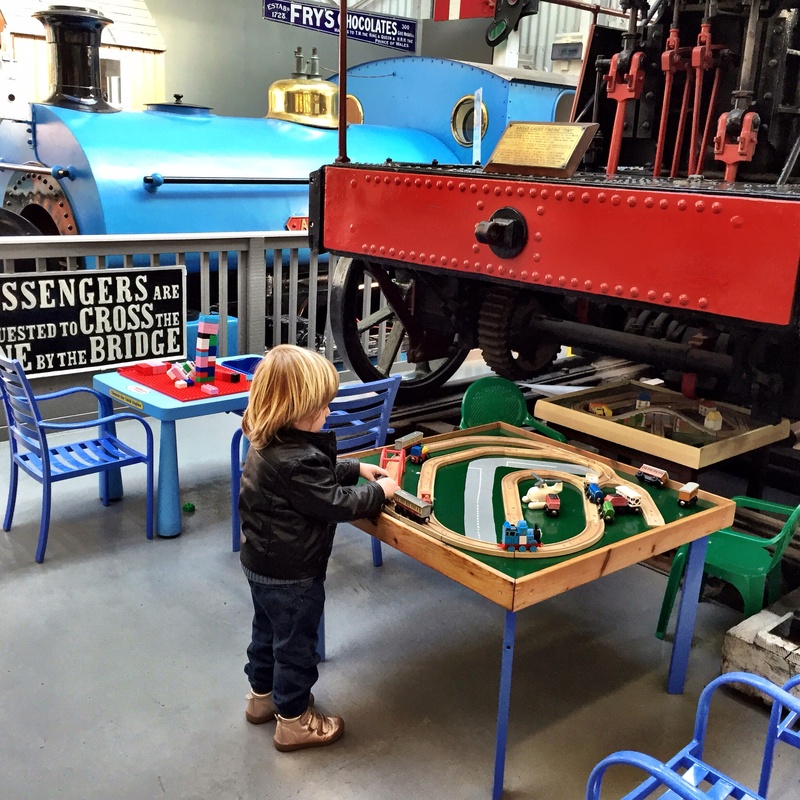 He loved the little museum too: pretending to be an engine driver, and finding some actual Thomas trains to play with. 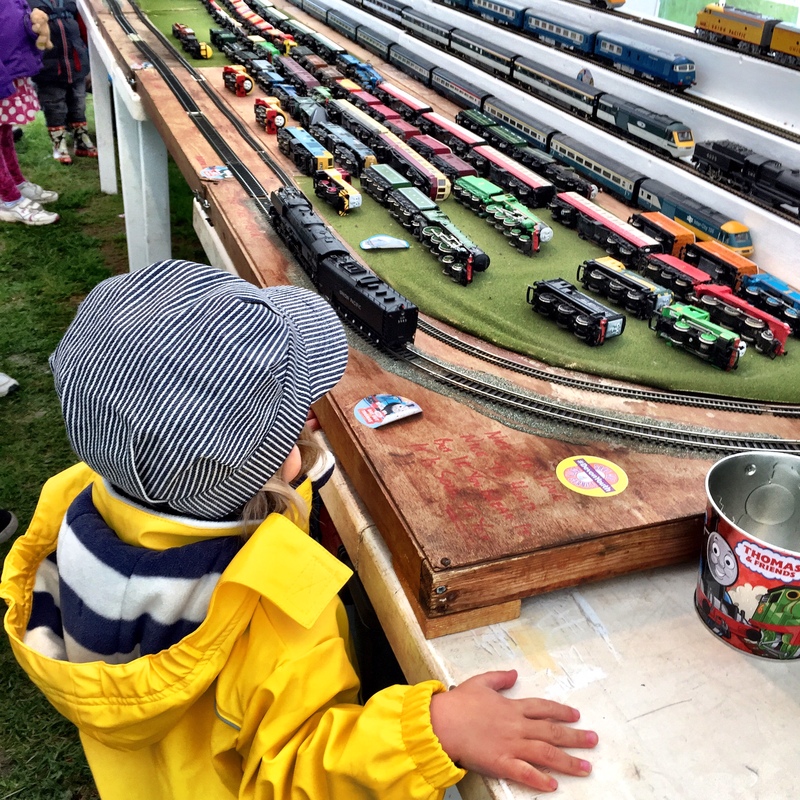 There was even a fantastic garden model railway, being tended my some older railway enthusiasts. 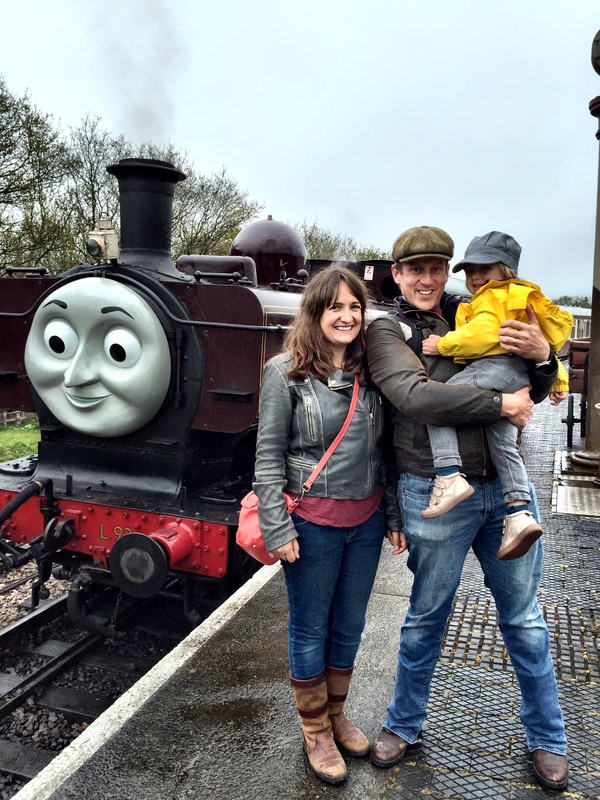 I think Arthur would have happily watched the trains going round until it had got dark if we’d let him. 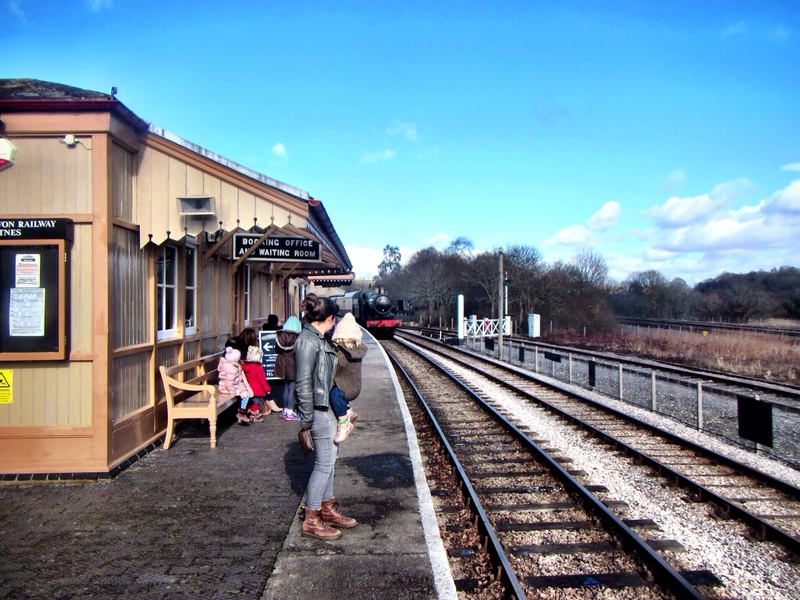 But we did have to get back, so we made our way to the platform to find a train big enough to carry us. The light was beginning to fade as we journeyed back along the river, but somehow that only made the whole scene more beautiful. 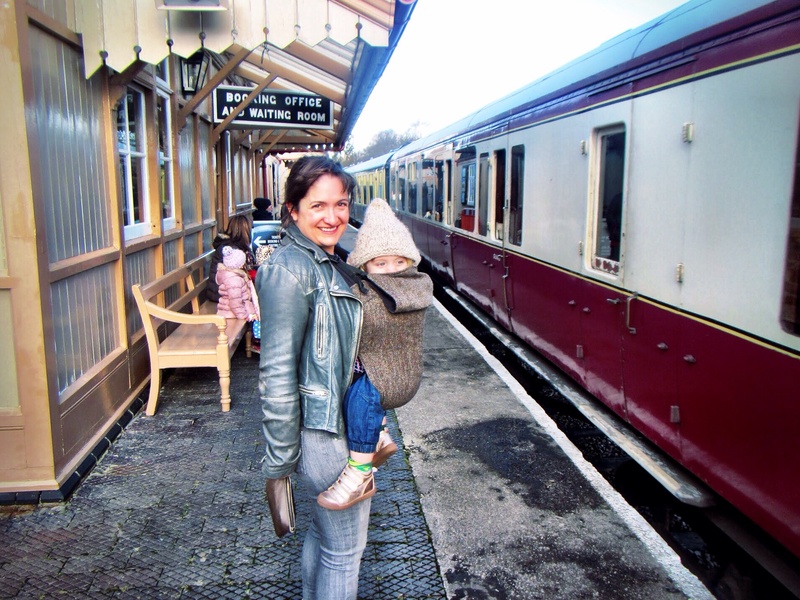 When we arrived back at Totnes there was one more treat in store. 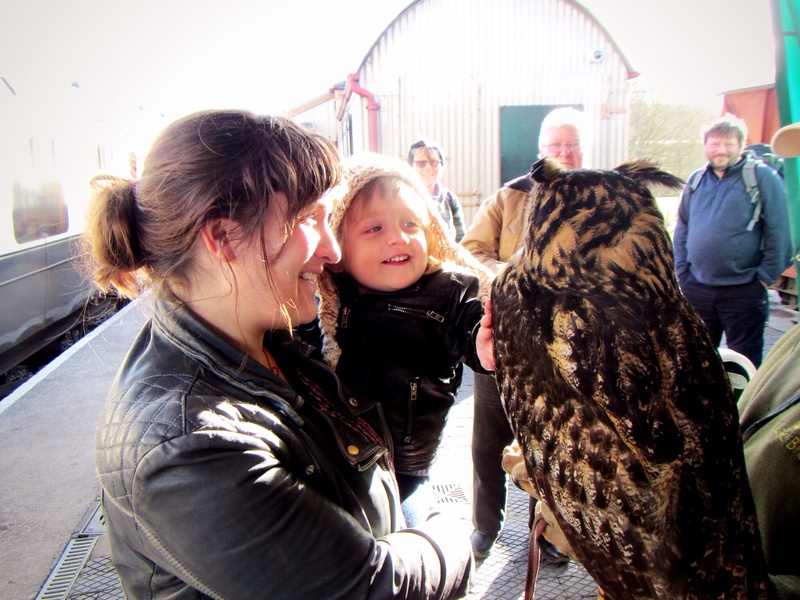 The Rare Breeds Farm is currently closed for the season, but an owl had come out to say hello to people at the station. He was incredibly tame and friendly. 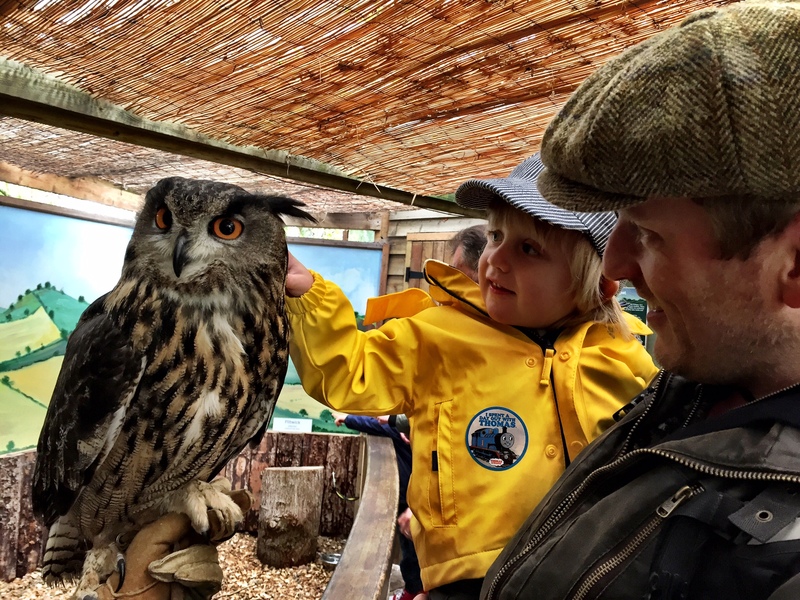 Arthur was able to stroke him and give him a cuddle, and when he waved goodbye the owl flapped his wings in return. 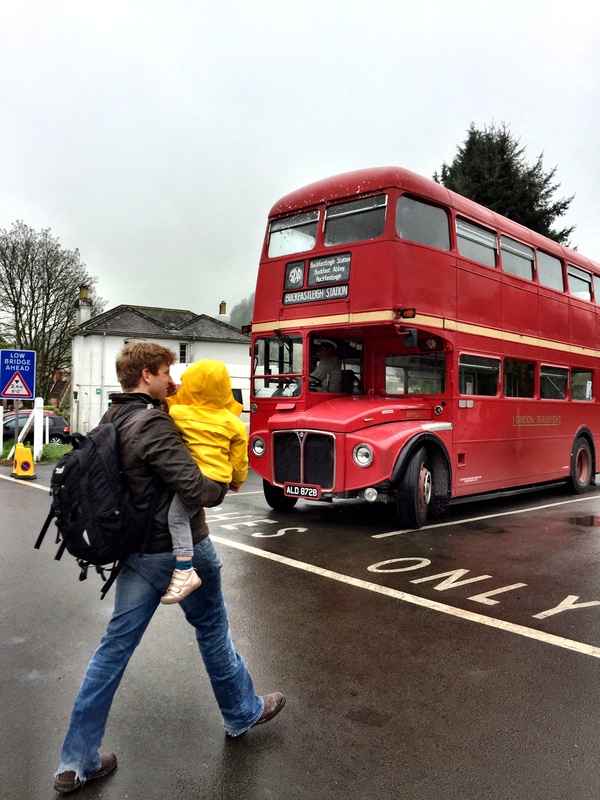 Suffice to say when we headed back to the car it was with one very happy little boy. 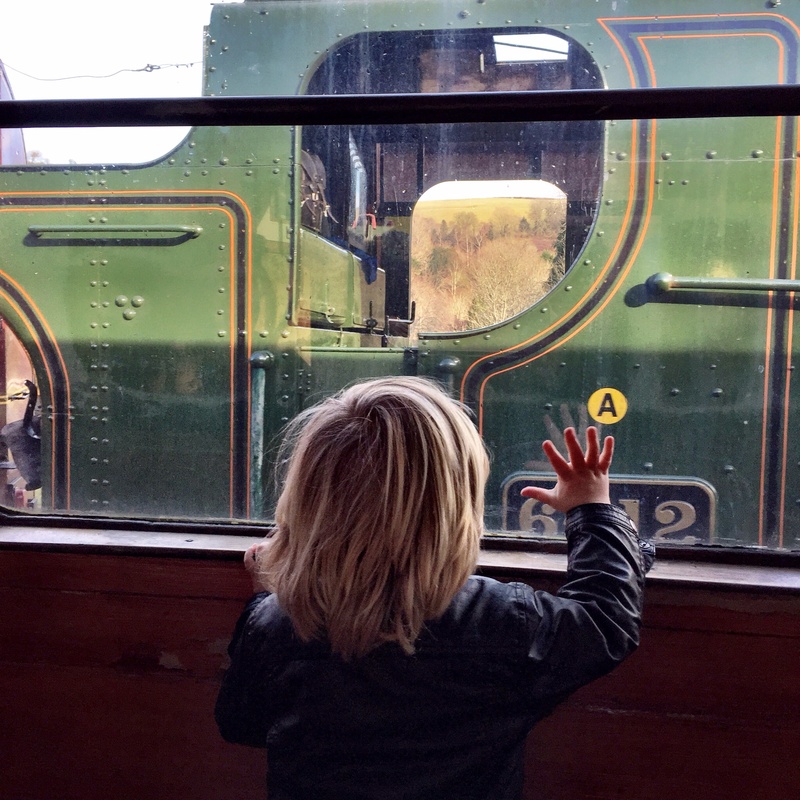 All in all it was a fantastic family afternoon – we can’t wait until our next trip on this very special railway. 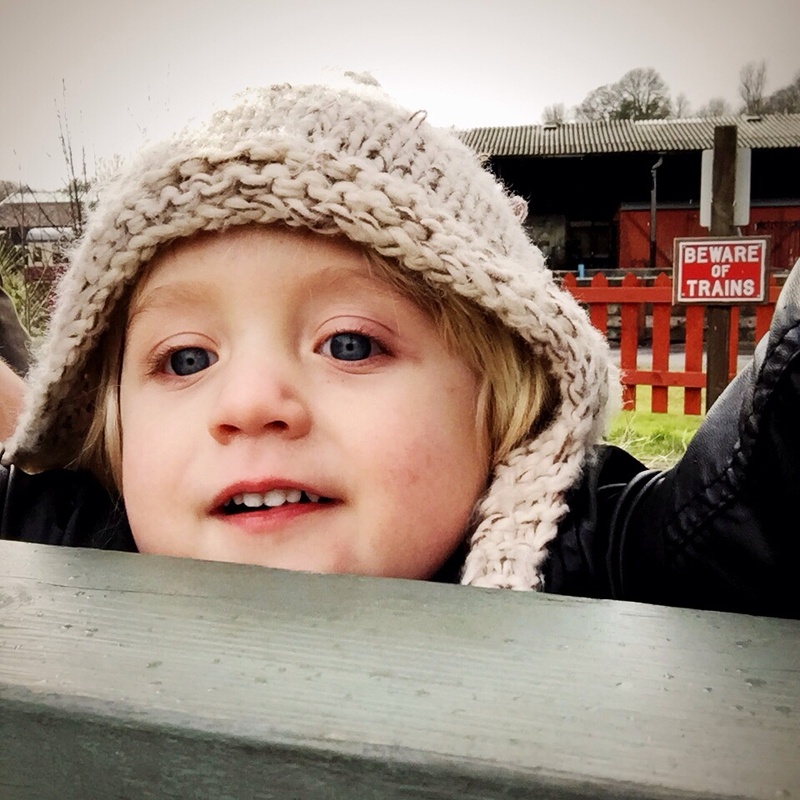 This entry was posted in Sophie is parenting, Sophie loves Devon and tagged Buckfastleigh, Devon, Devon bucket list, family day out, Rare Breeds Farm, South Devon Railway, toddler, Totnes, trains on February 28, 2015 by sophieblovett. 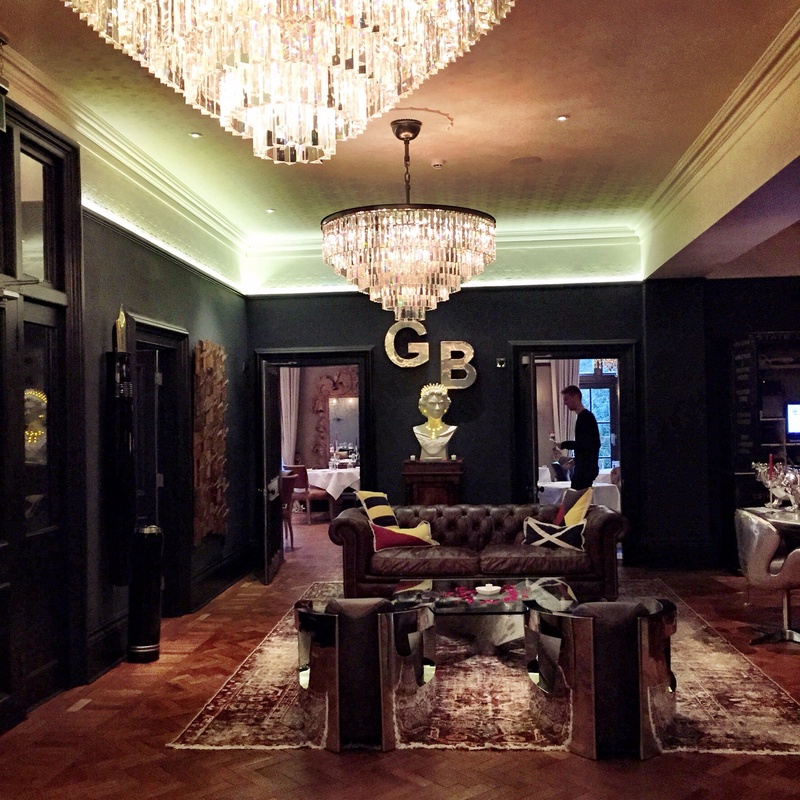 Last weekend Leigh and I did something we have not done for a very long time: we spent a night away, just the two of us – in the wonderfully glamorous surrounds of Glazebrook House. 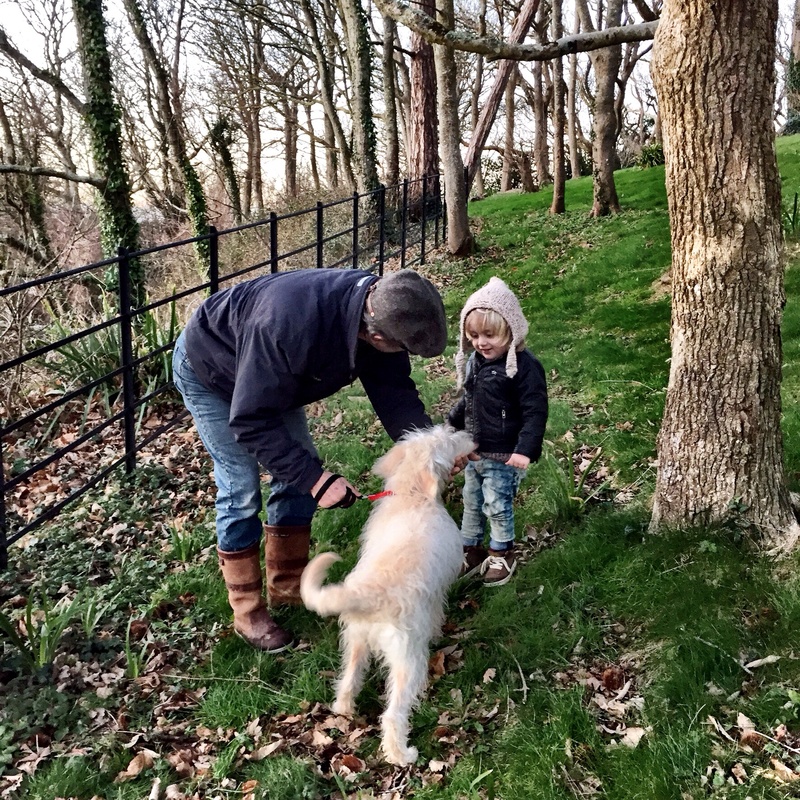 It’s actually the first time in two years I’ve spent more than a few hours away from Arthur – and the first time Leigh has entrusted him to anyone other than me. 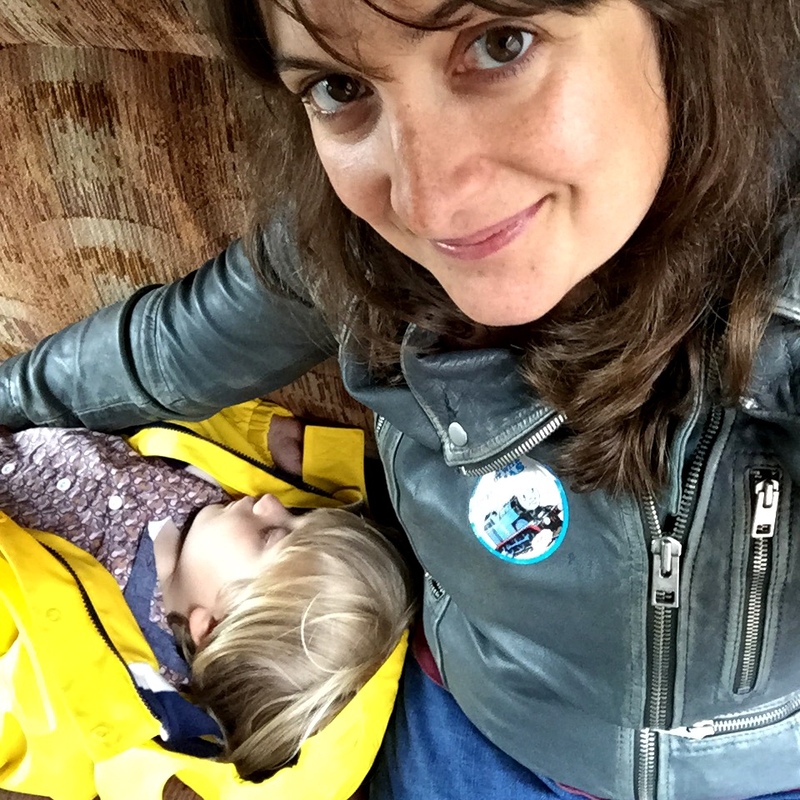 We have both enthusiastically embraced attachment parenting, and despite encouragement from various directions have really not wanted to leave him overnight. 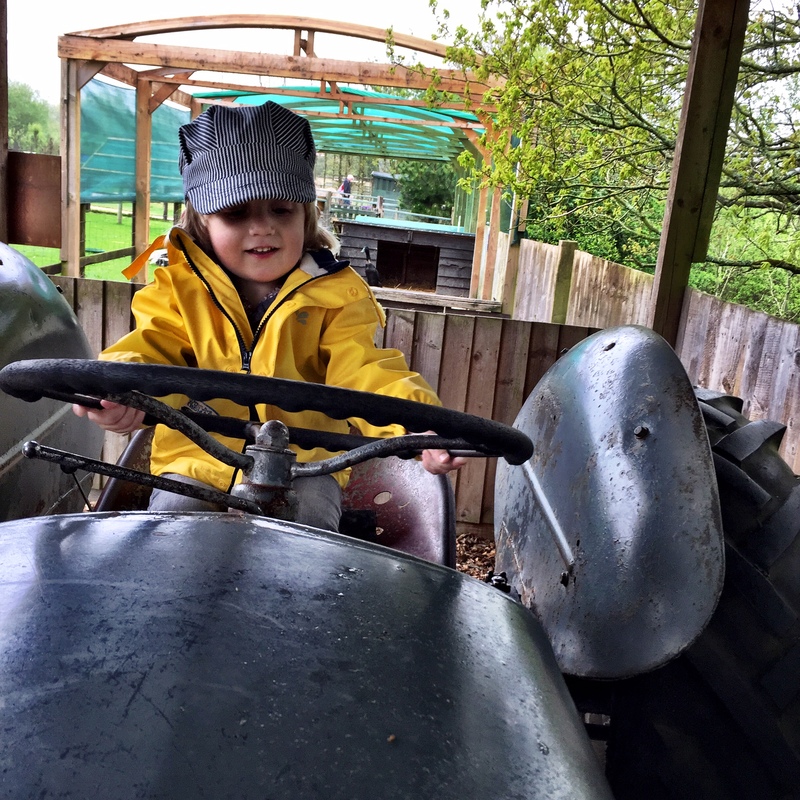 But as he’s got older, and we have seen him grow into an increasingly confident, self-assured little boy, the prospect started to seem a little less scary. 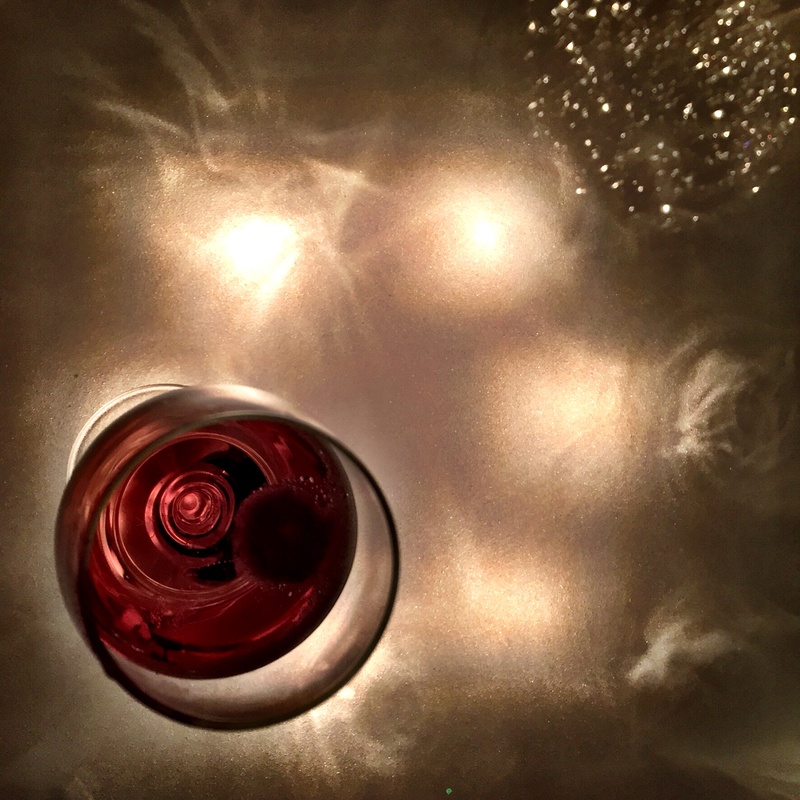 On top of that, I think we both have begun to yearn for a little more romance in our lives, the space to focus on our relationship and remember just how much we enjoy each other’s company. 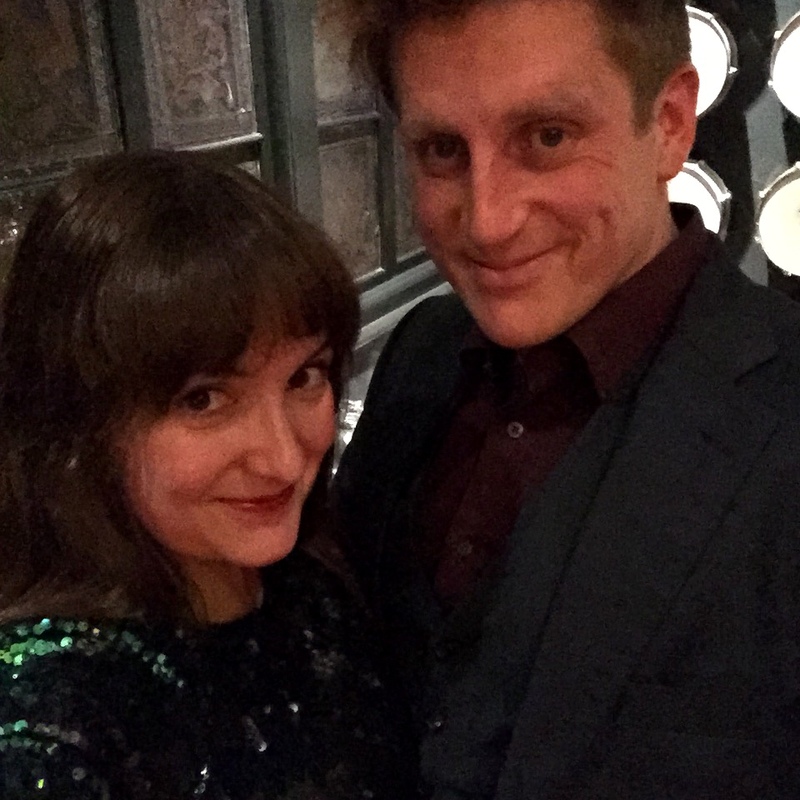 For Leigh’s ‘homemade’ Christmas present I gave him the promise of twelve dates – the opportunity once a month to do something special, just the two of us. 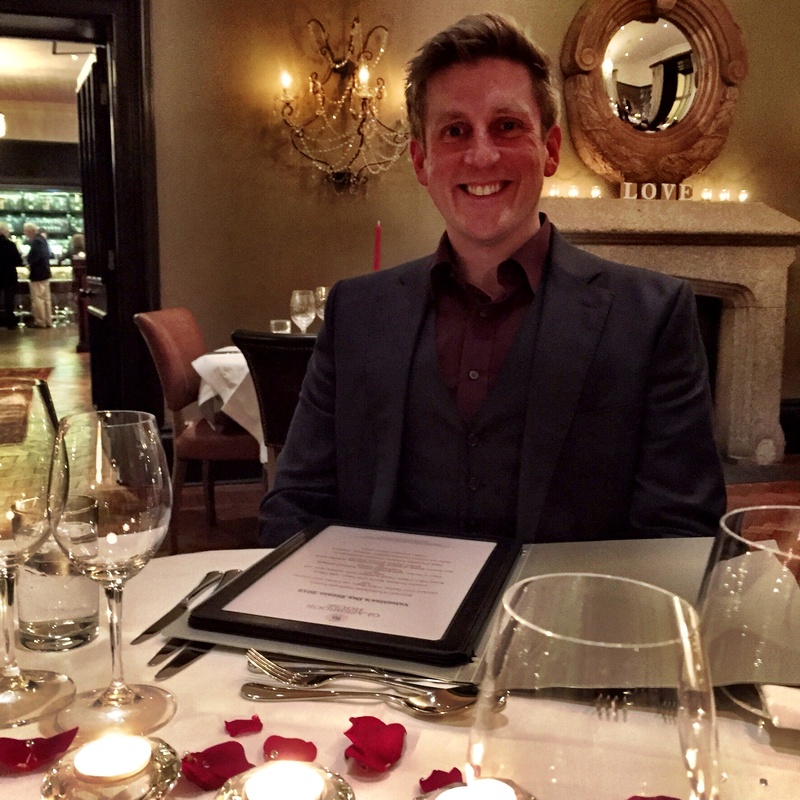 Now admittedly not every date is going to take place at a swanky hotel (sorry Leigh). 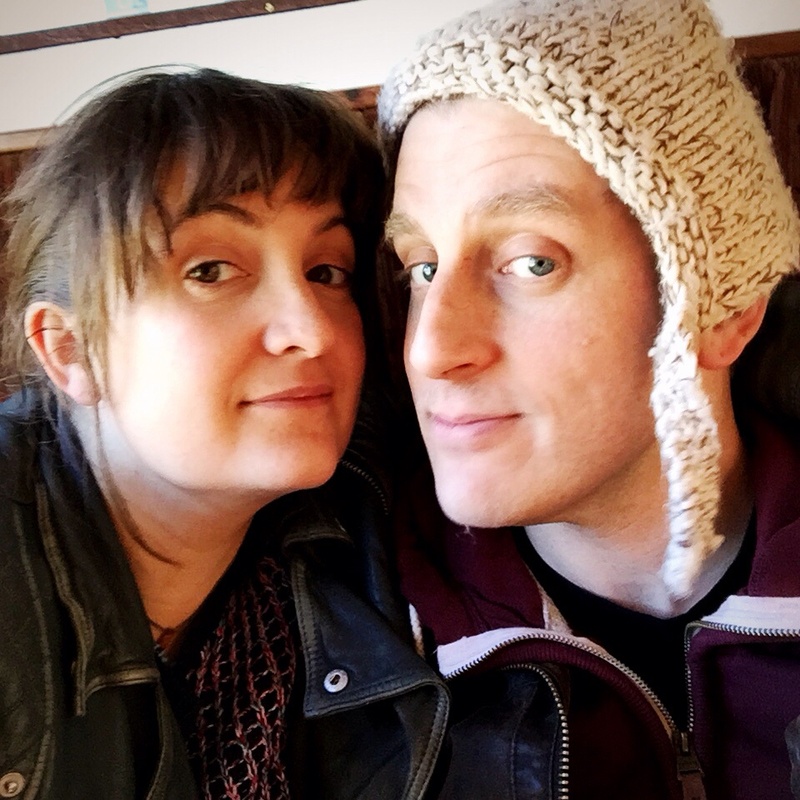 Last month we went to the cinema, but Valentine’s day seemed like the perfect opportunity to ramp things up a little – especially as it’s also the five year anniversary of our first date in just a couple of weeks. And having come across Glazebrook House when my soon-to-be sister-in-law invited me to a wedding fayre there, I was already looking for an excuse to go back. 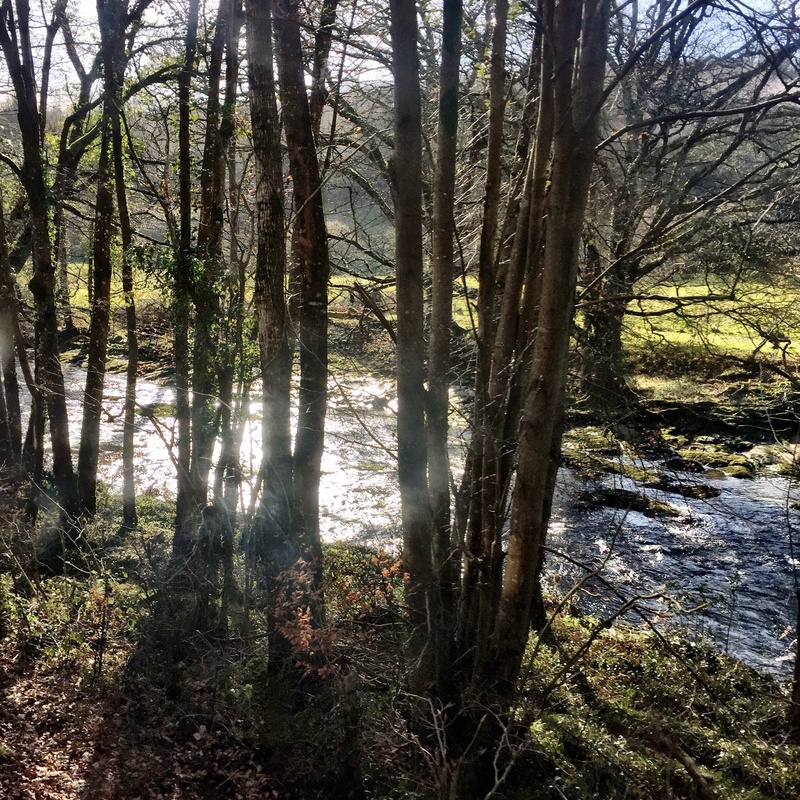 It’s not that far from us – just on the edge of Dartmoor – but stepping into the lobby actually feels like entering a member’s club in London or New York rather than a country hotel. 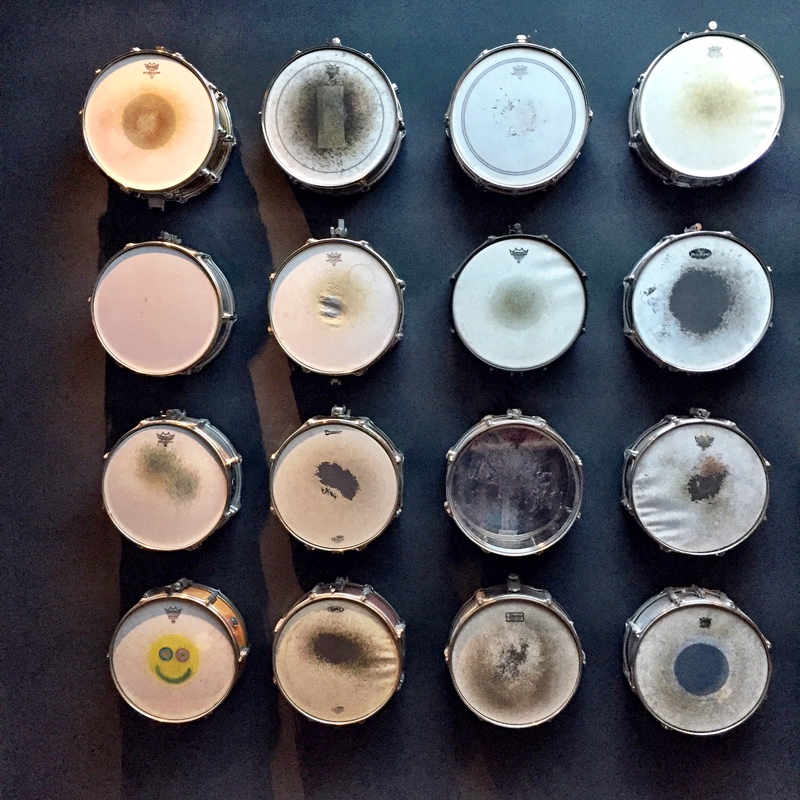 We were surprised to discover it’s only been open a year – it feels like it’s been there forever, though at the same time it is unmistakably current. 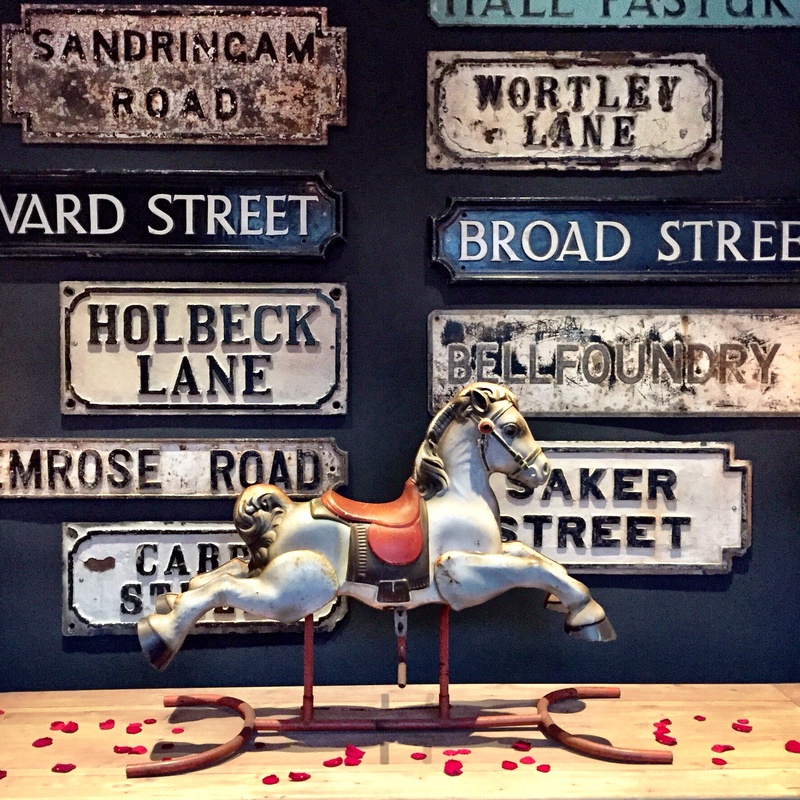 The design is quirky and eclectic, from the drums hanging in the stairwell to the rocking horse framed by vintage street signs on the landing. 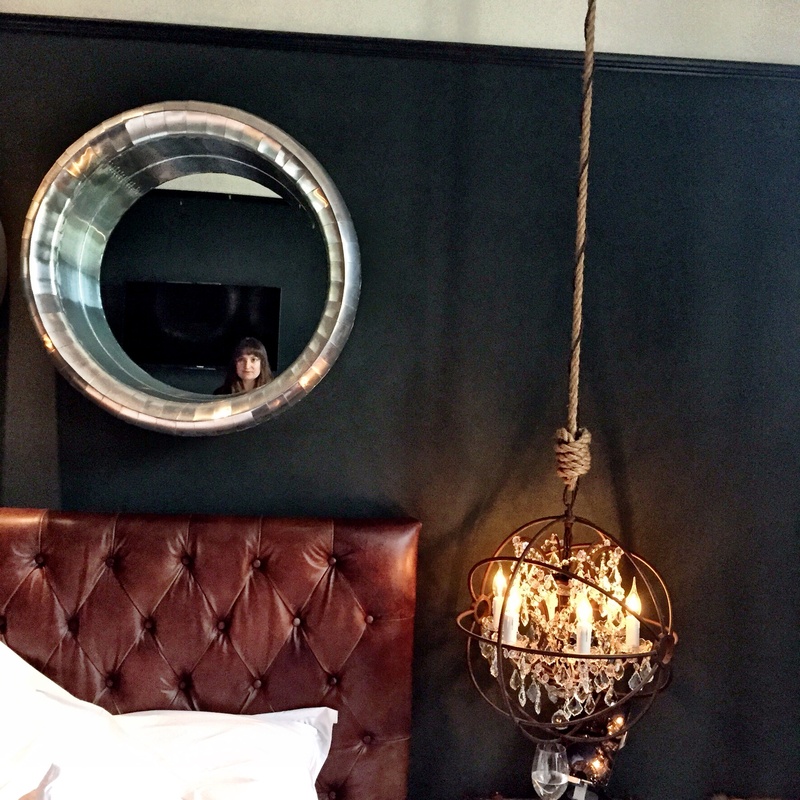 Our room was utterly gorgeous too, with its insanely comfortable chesterfield-style bed, the industrial low-hanging chandeliers and the stunning and funky aircraft-engine mirrors. All in all it was the perfect setting to get away from it all, and we certainly made the most of our freedom. 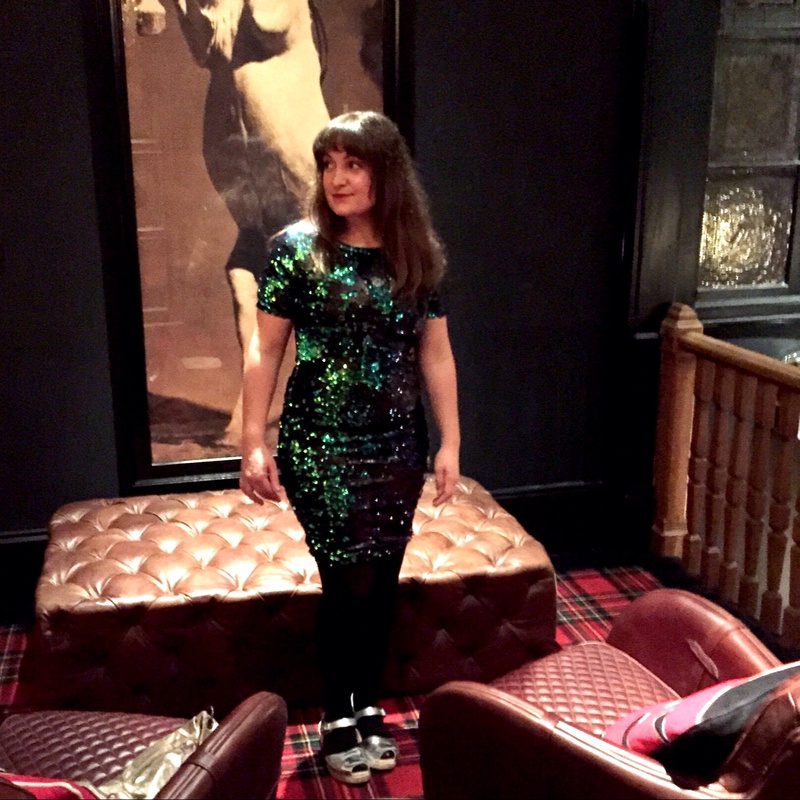 I’d been longing to go somewhere I could get away with wearing the turquoise sequinned dress I’d optimistically picked up in Portobello Road last year, and this was just the place. 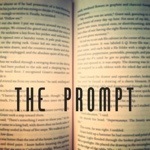 Leigh donned his wedding suit, and we headed to the bar for a pre-dinner drink. I happily could have stayed there all night actually – hanging out in bars is one of the things I really miss about London (and pre-baby) life. 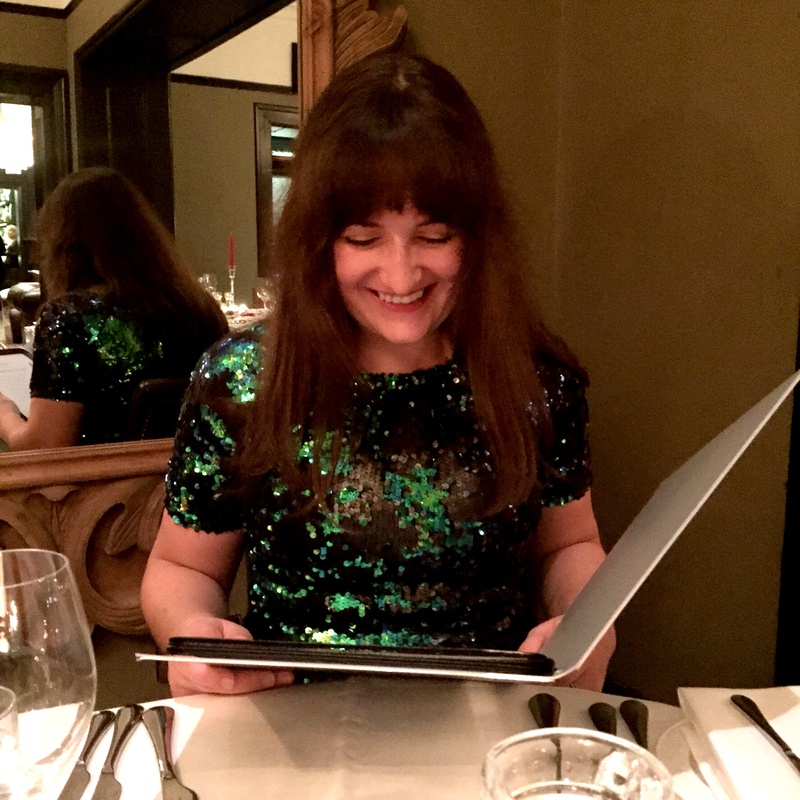 We were excited by what dinner would offer though – and aware that our stamina was no doubt not what it once was – so soon headed through to the restaurant. The food did not disappoint. Melt in the mouth chicken parfait, lobster cocktail and luscious turbot. Most importantly for me though the chef assured us that absolutely everything was nut free – right down to the chocolatey dessert. I’d mentioned my allergy when we booked and they’d clearly taken it very seriously. 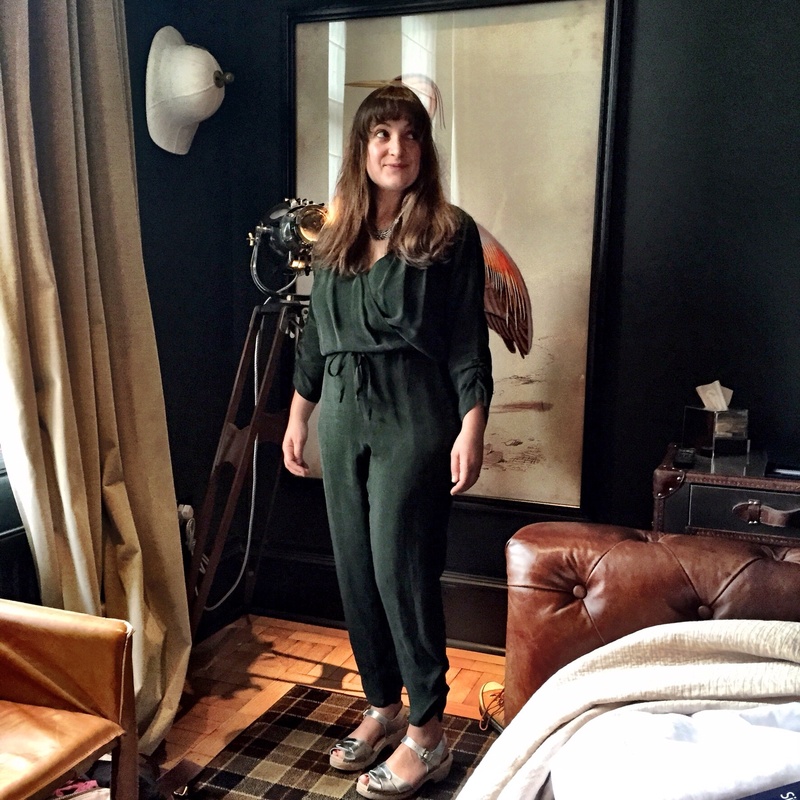 We were both a little worse for wear the next morning, but I was determined not to kill the glamorous vibe and donned my new favourite jumpsuit for breakfast. By this point we’d almost convinced ourselves we were actually on holiday, and felt a million miles away from the stresses of everyday life. 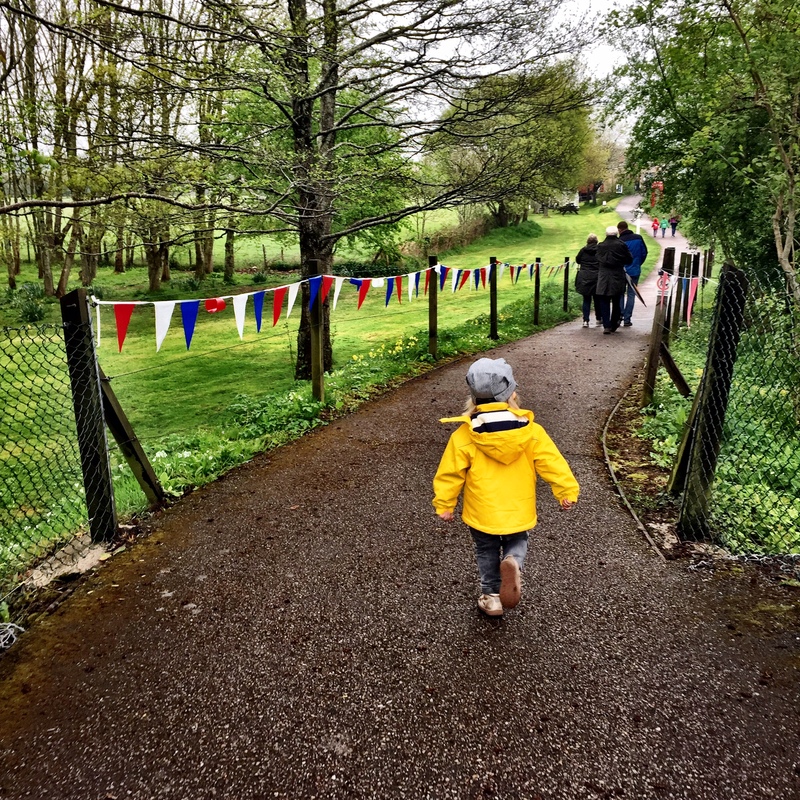 We were however beginning to feel the absence of a certain little person, and after eggs royale and lots of coffee it was time to go and see what he’d been up to. 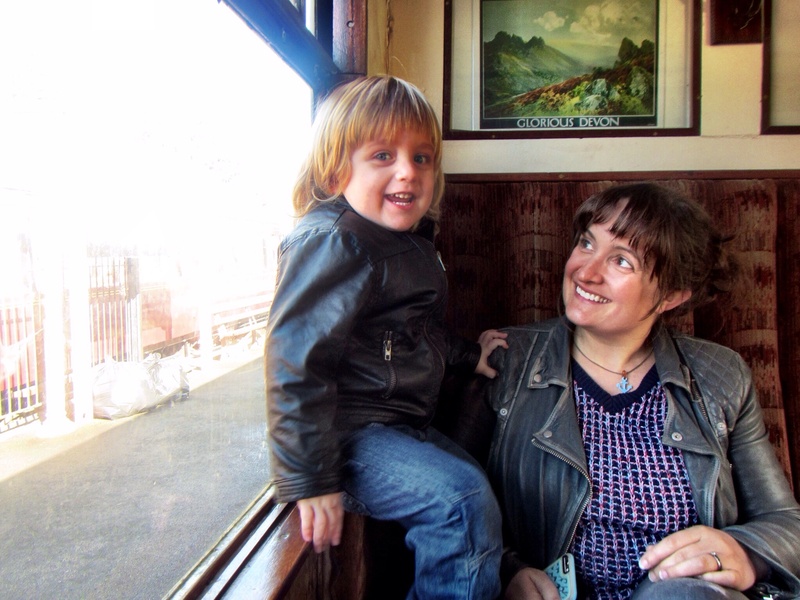 Arthur had, of course, had a wonderful time with my parents, as my mum’s photos show. In fact I think he probably enjoyed himself just as much as we had what with the train tracks and stone throwing and walking the dog, though he was still very pleased to see us when we turned up. 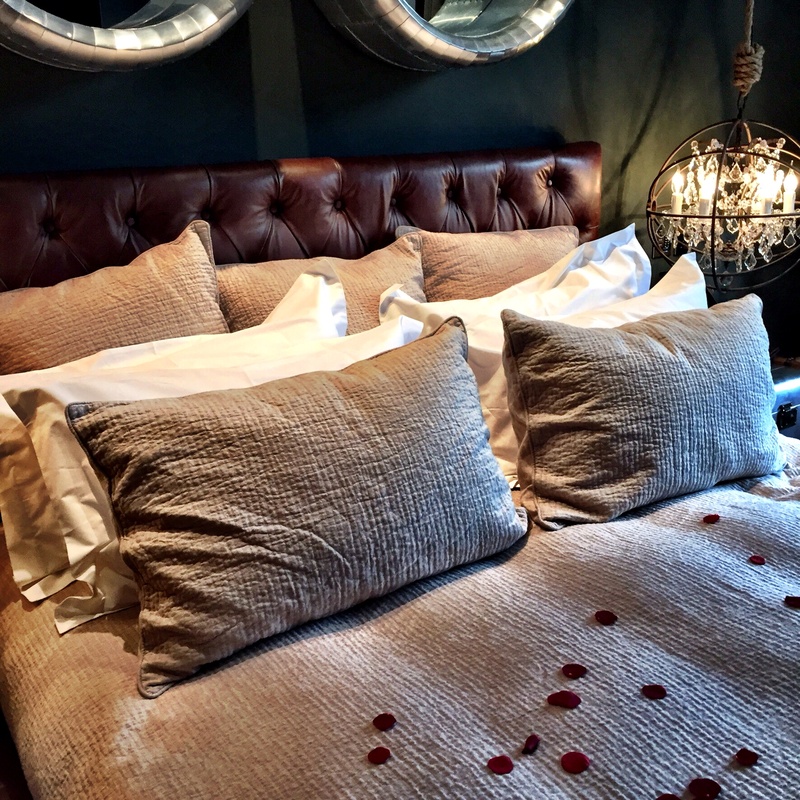 This entry was posted in Sophie is, Sophie is partying, Sophie loves Devon, Uncategorized and tagged date night, glamour, Glazebrook House, marriage, romance, Valentine's on February 16, 2015 by sophieblovett. So when this week we had friends to visit and the sun came out to greet them we breathed a sigh of relief and headed out into the fresh air. There’s nothing quite like hanging out with old friends to rejuvenate the soul. Emily and I were partners in crime when we were sixteen, and I feel so lucky to still have her in my life twenty years later. She is about to embark on an uber exciting house-building project with her family, so they began their stay at my folks’ place to get some inspiration from the major renovation they’ve just completed. 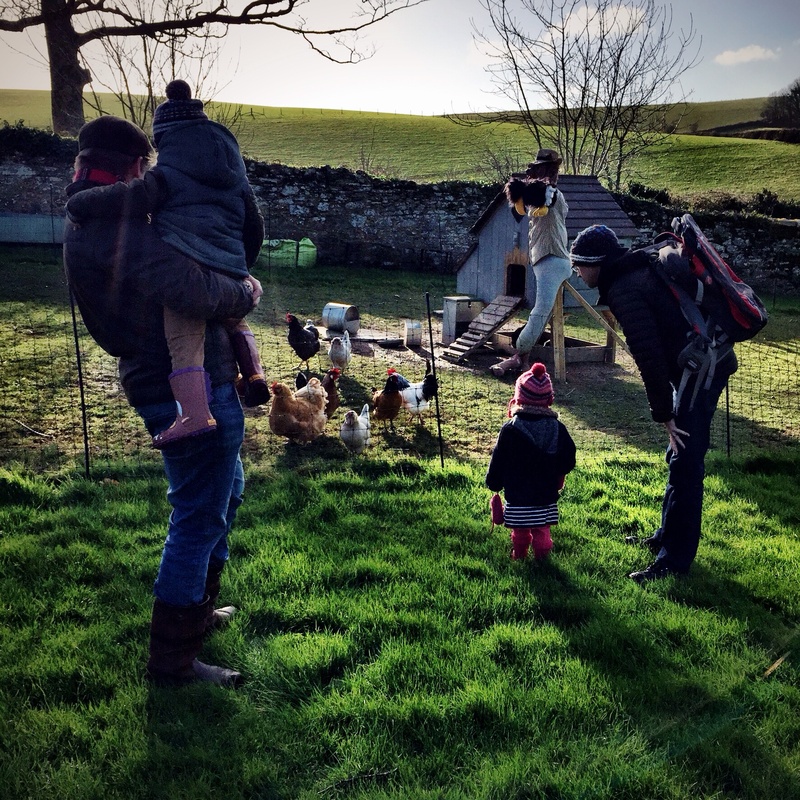 Whilst we were there we made the most of the beautiful countryside: feeding the chickens, seeking out snowdrops, and exploring the deep dark woods. 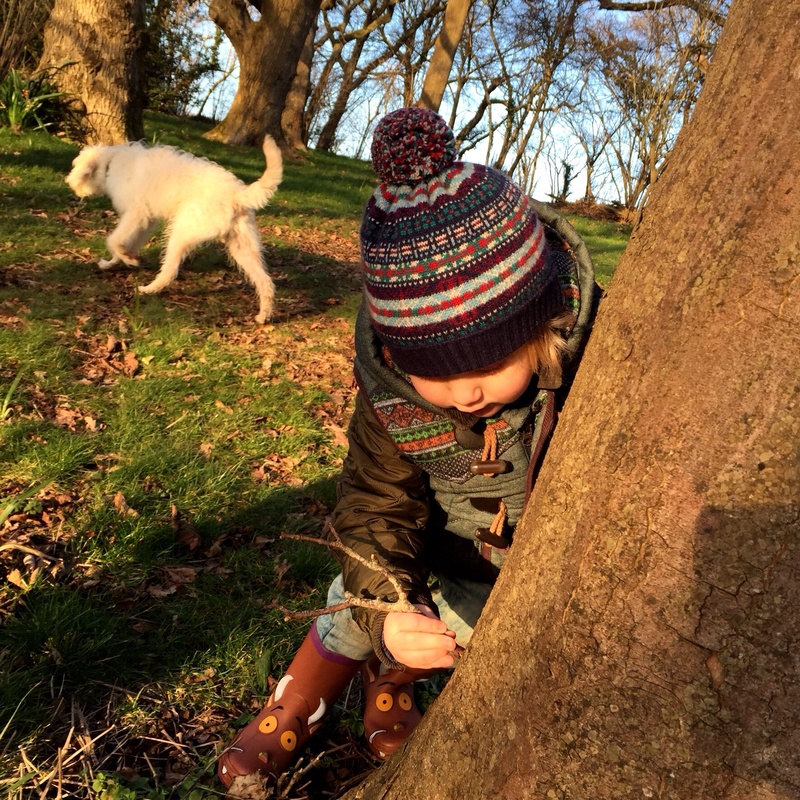 Arthur spent a while at one particular tree, scratching away with a stick. I asked what he was doing and he said ‘writing’ (silly). When I asked what he was writing he said ‘the story of mummy and daddy’. 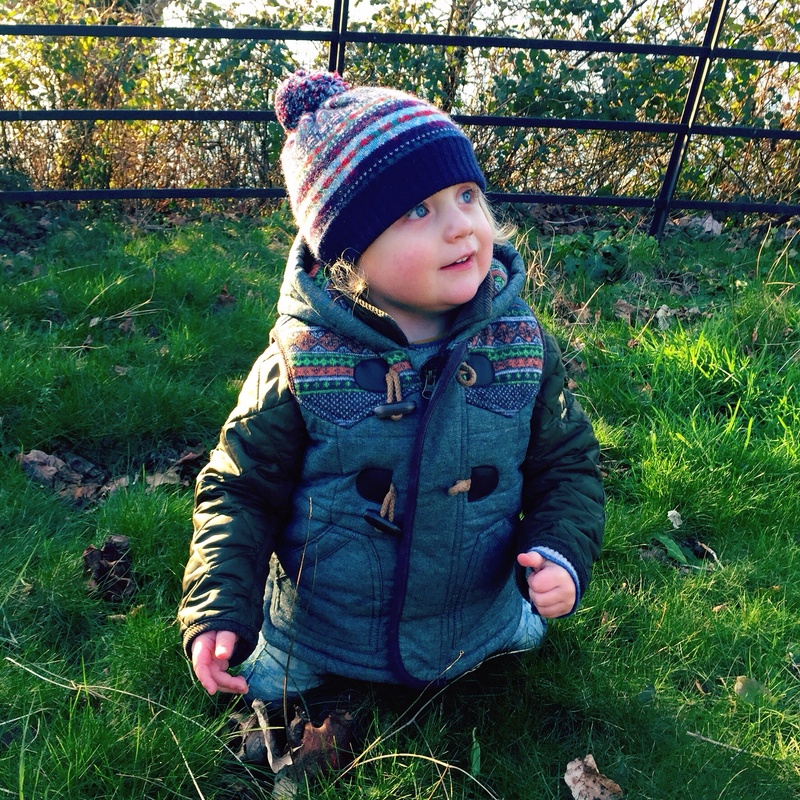 Nothing like the great outdoors for a bit of inspiration. 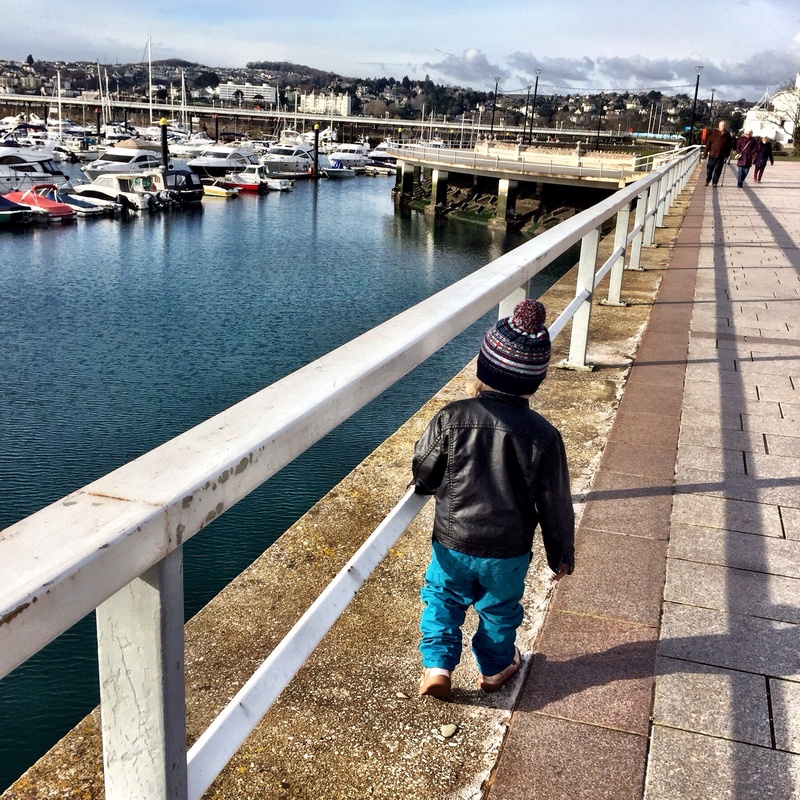 After twenty four hours in the beautiful South Hams we headed back to Brixham. 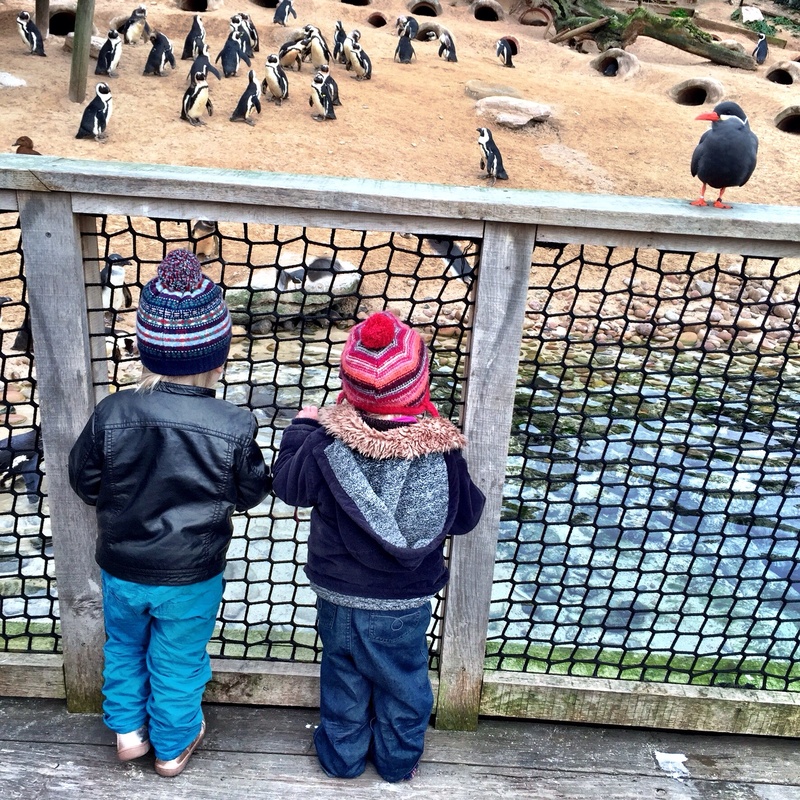 There had been much talk of penguins, so there was nothing for it really but to head for Living Coasts. 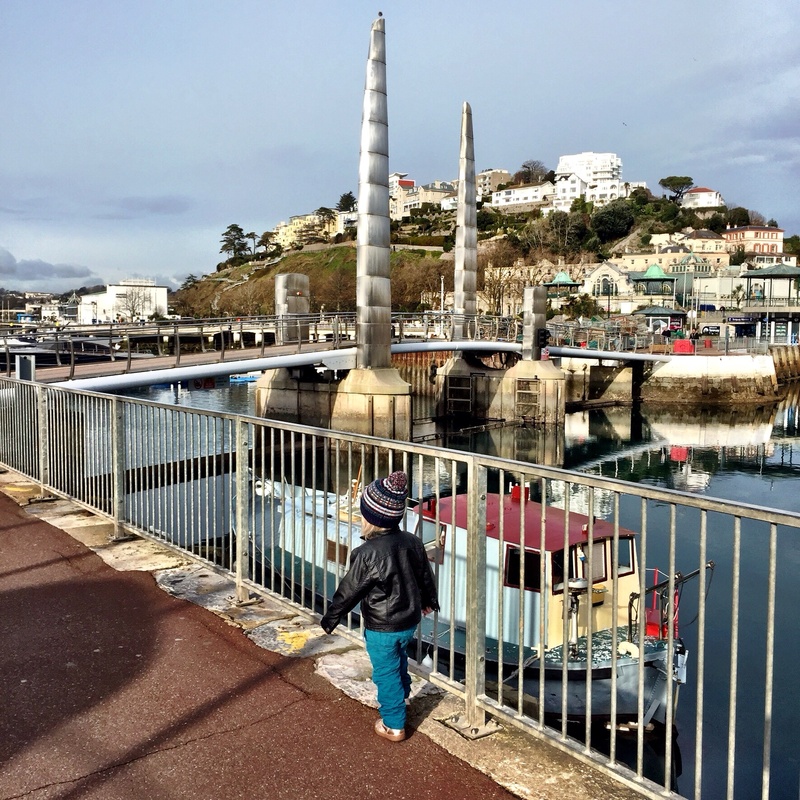 We finally got to try out the new year-round ferry, and spent a day in beautiful sunshine in Torquay. 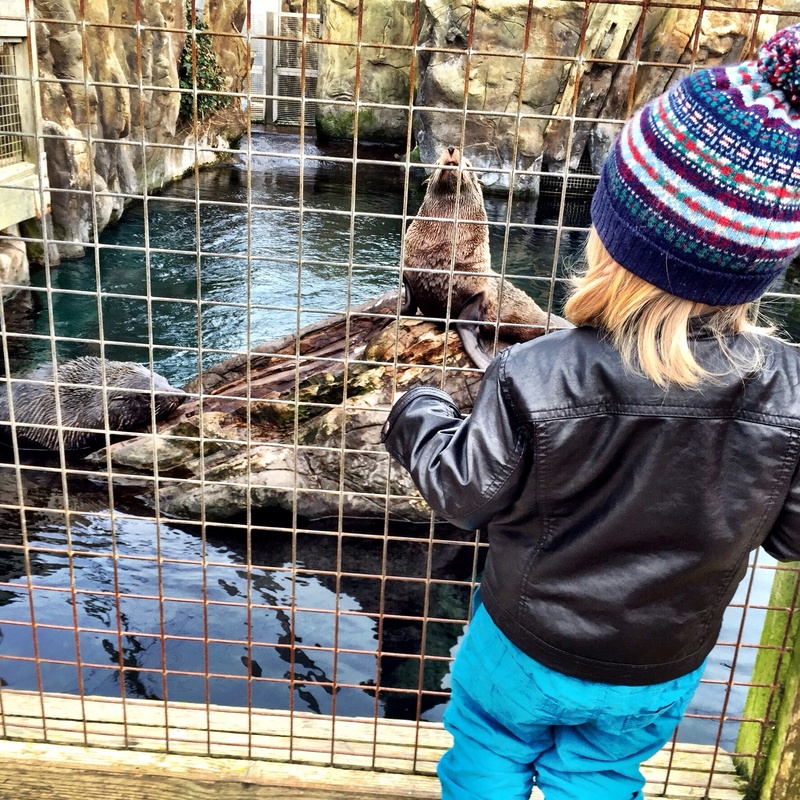 We had a bit of a stroll (and the obligatory fish and chips) and then headed to our awesome coastal zoo. 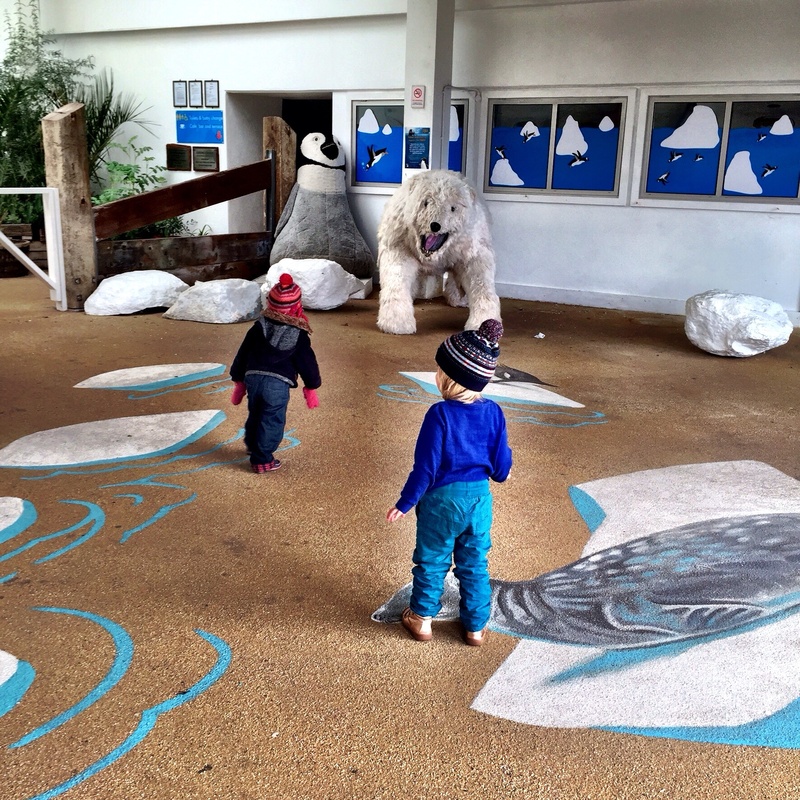 The toddlers were in their element here, and it was so lovely to watch them explore and bond. On their last day we stayed closer to home. 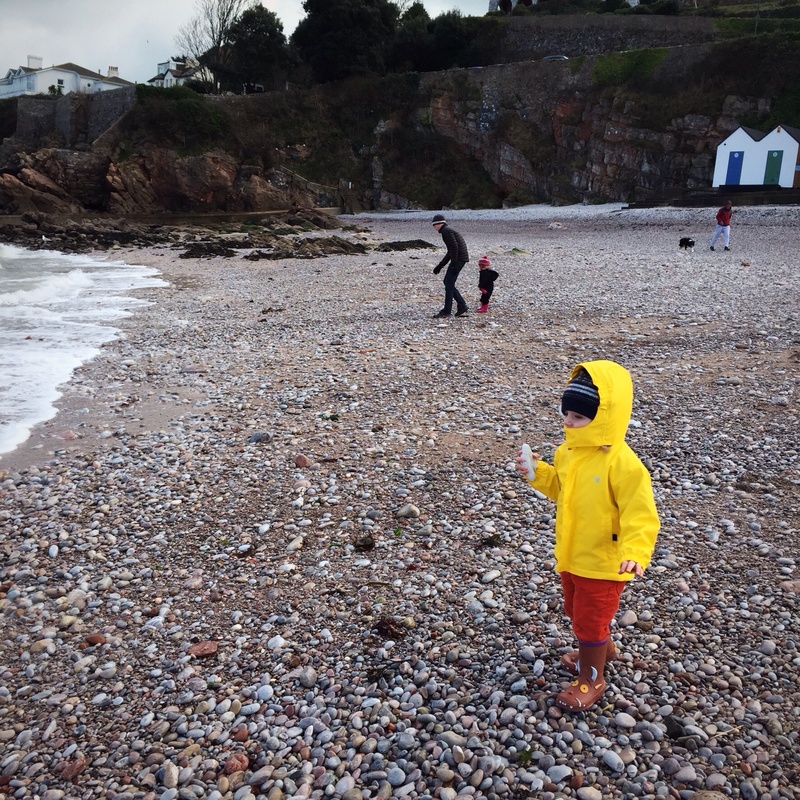 It was properly freezing, but we made it to Breakwater beach for some bracing pebble throwing. Though our friends were only here for three days, I feel like we’ve crammed at least a month’s worth of adventures into that time. And on top of that I’ve been reminded how lucky we are to live where we do: we will most definitely be getting out more in February, whatever else the world throws at us. 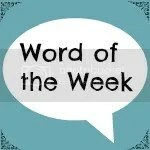 My word of the week this week is friendship. 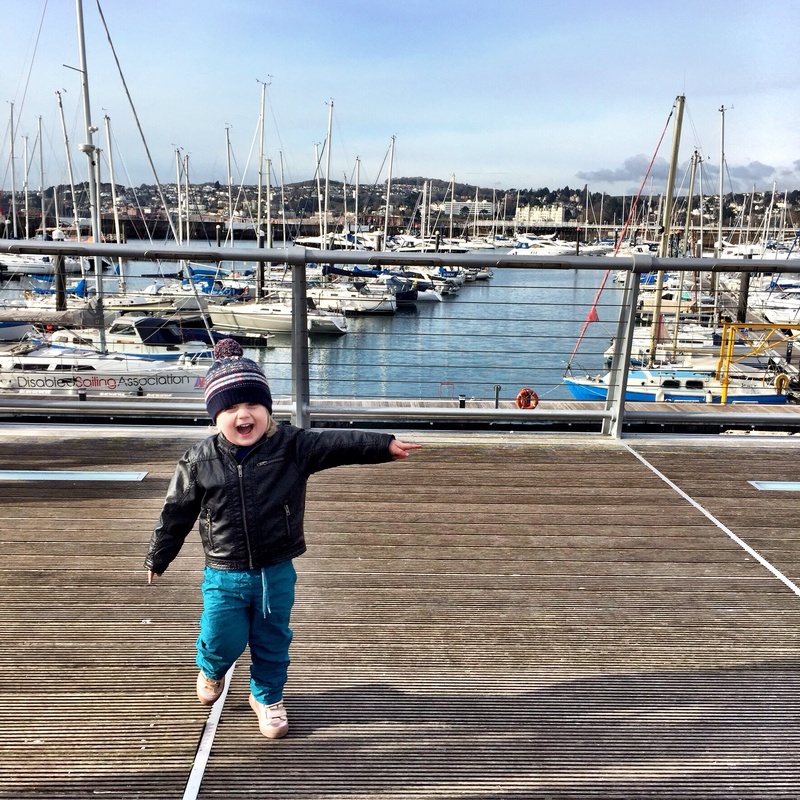 This entry was posted in Sophie is parenting, Sophie loves Brixham, Sophie loves Devon, Uncategorized and tagged Devon, fresh air, friends, friendship, Living Coasts, outdoors, relaxation, seaside, South Hams, Torbay on February 6, 2015 by sophieblovett. 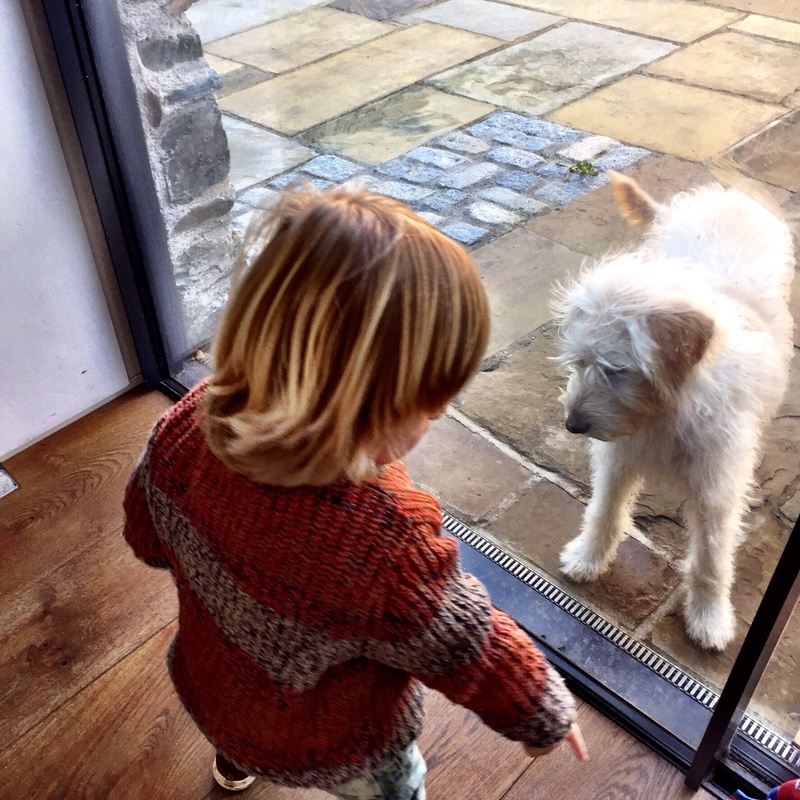 Last weekend we took Arthur to meet my parents’ new dog. 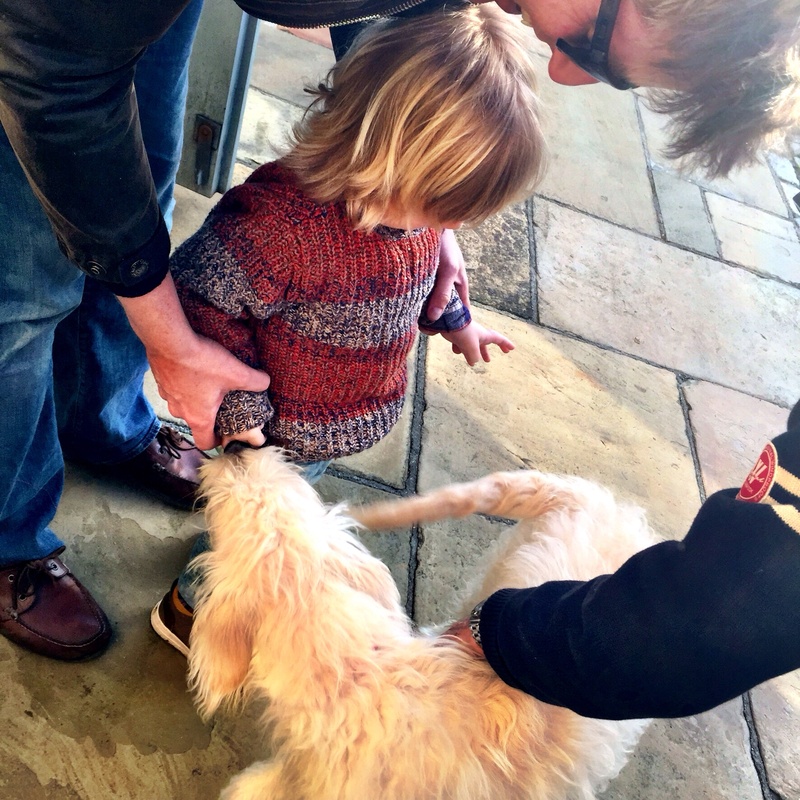 It was the first time Leigh and I had met him too, but Arthur was seriously excited. 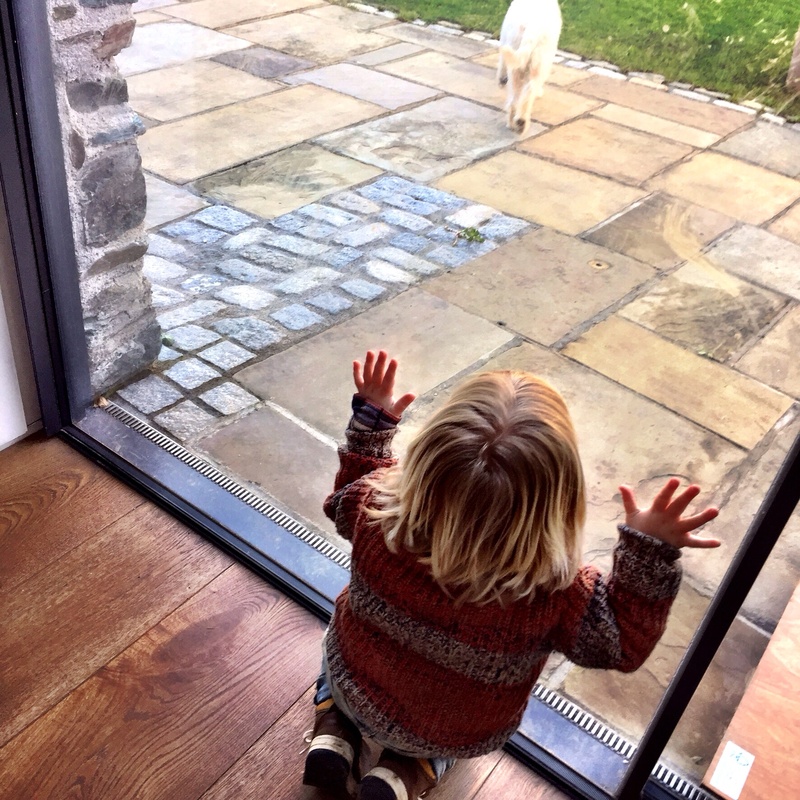 He loves the idea of dogs, but he hasn’t actually got up close to very many. So as soon as we started to talk about Grampa and Mimi’s new dog his interest was piqued. Despite (or maybe because of) the somewhat boisterous introduction, Arthur was pining for Merlin the minute we separated them. 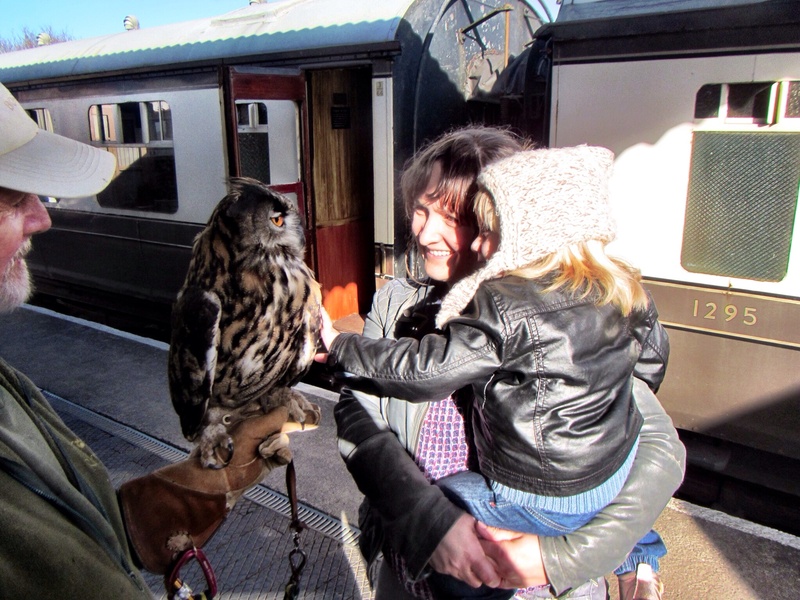 Merlin soon came back to play too, and as we grown-ups busied ourselves with lunch they were busy chatting and bonding through the glass door. 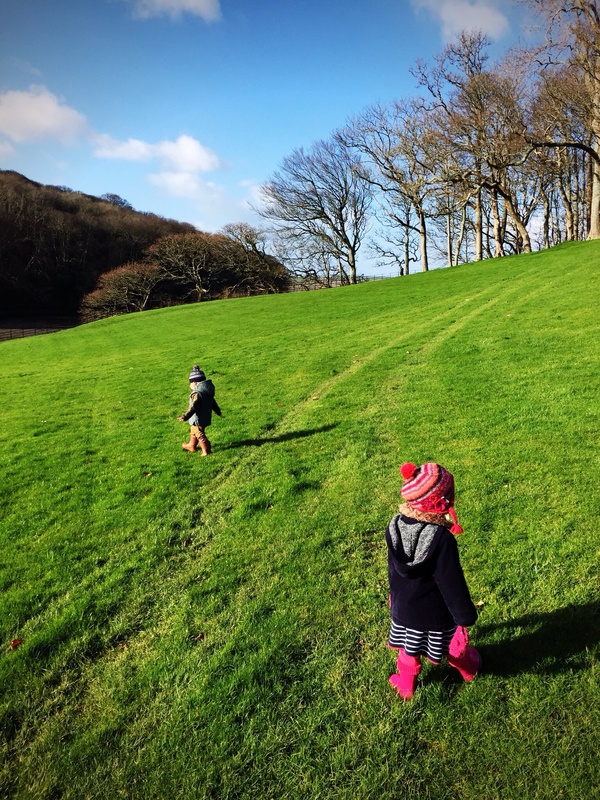 Once lunch was out of the way, we took the two toddlers out to play. 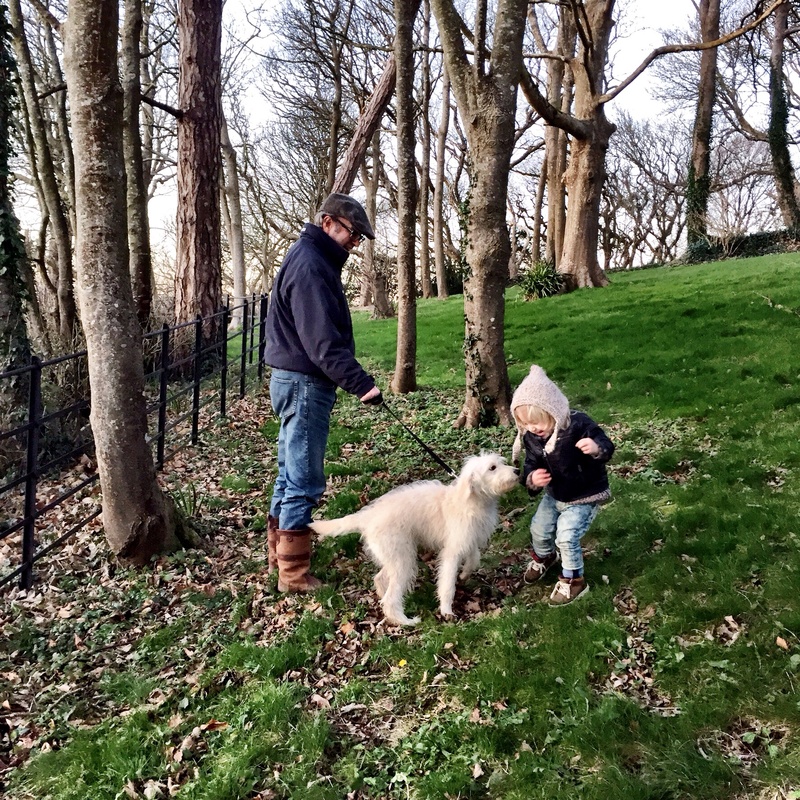 We started out with Arthur in the sling and Merlin on the lead, but gradually gave them a bit more freedom. There was a particularly lovely moment up in the woods. Both boy and puppy needed constant reminding not to be too over-enthusiastic in their investigation of each other, but still they clearly relished each others’ company. 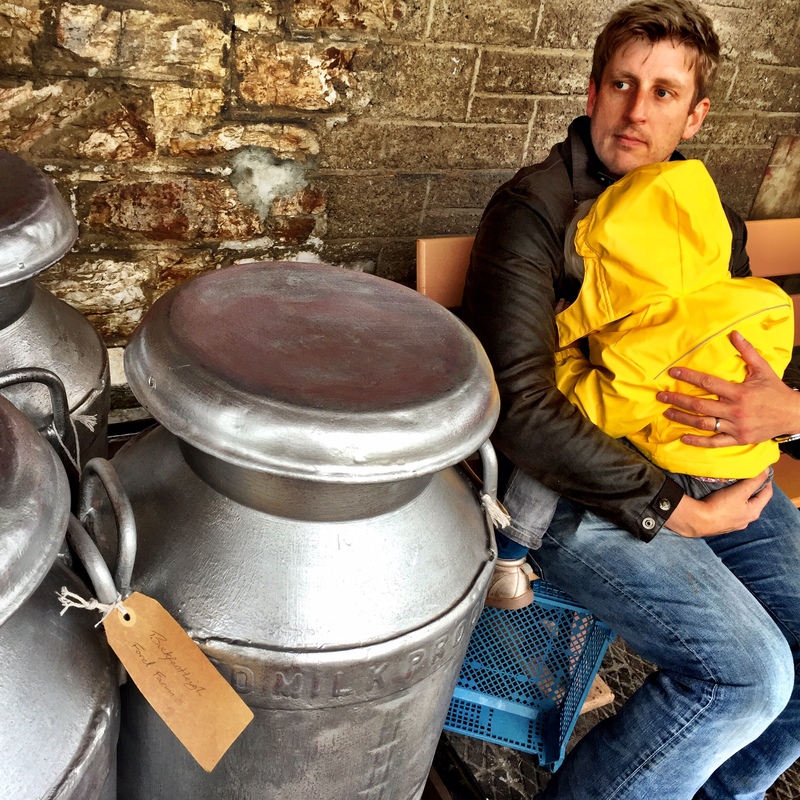 I have a be a feeling that Arthur and Merlin are going to be very good friends. I can’t quite get my head around owning a dog for various reasons, but with this beautiful creature not far away for woodland walks and beach fun we should have the best of both worlds. 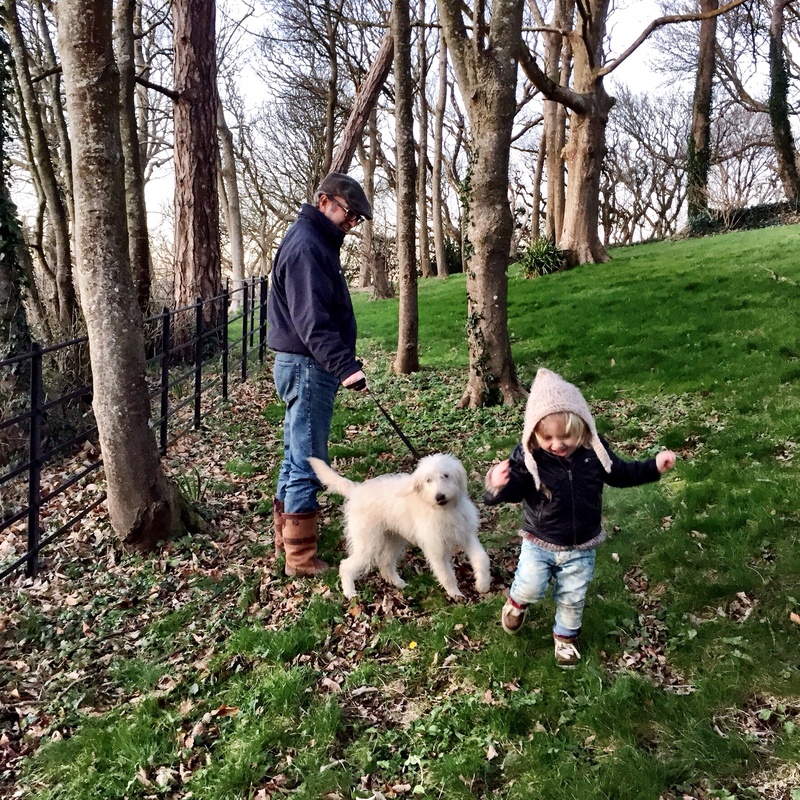 This entry was posted in Sophie is parenting, Sophie loves Devon, Uncategorized and tagged dog, puppy, toddler, woodland on January 24, 2015 by sophieblovett.